Wednesday morning we rented bikes from the hotel and went to a French restaurant, Boulangerie, for croissants and ran into Mats and Robert (our friends from the night before). 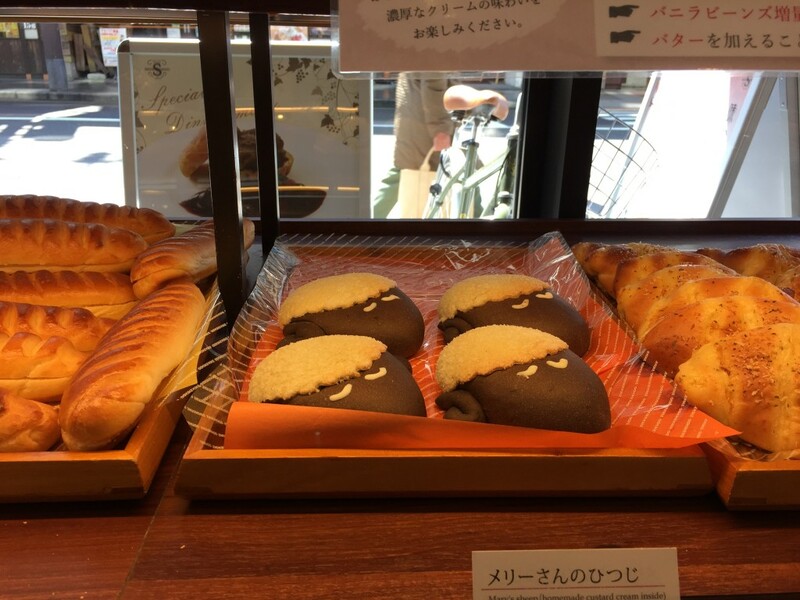 Boulangerie Sheep pastries—obviously, because it’s the year of the sheep. Then we continued our search for gloves until we finally found, what I’m convinced they are the last two pairs in Kyoto (they have some serious personality). 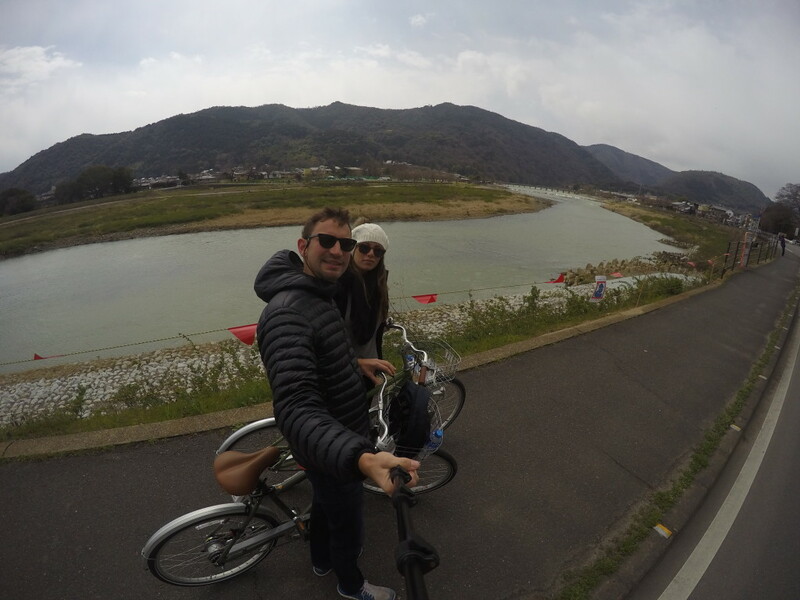 Then we biked for an hour in thirty-degree weather to Arashiyama. As we were crossing the Togetsu-kyo Bridge near the main street area, it started to rain and hail (so fun). So we parked our bikes and searched for shelter. We found a soba restaurant but when Daniel went inside to ask how long the wait would be, the hostest refused to acknowledge him. So we walked down the road and found a cute Japanese style restaurant (I think it was called Shigetsu), which much nicer service. 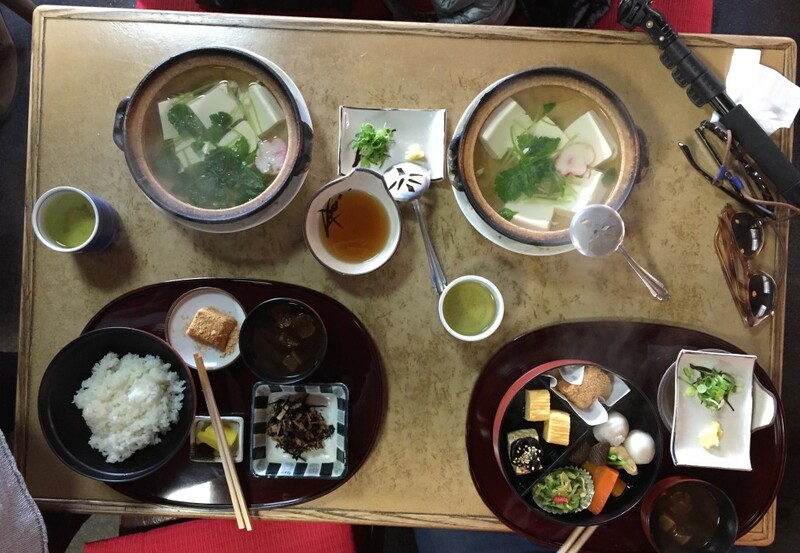 We ate a very traditional meal, but it was very bland, nonetheless, lunch was an experience. 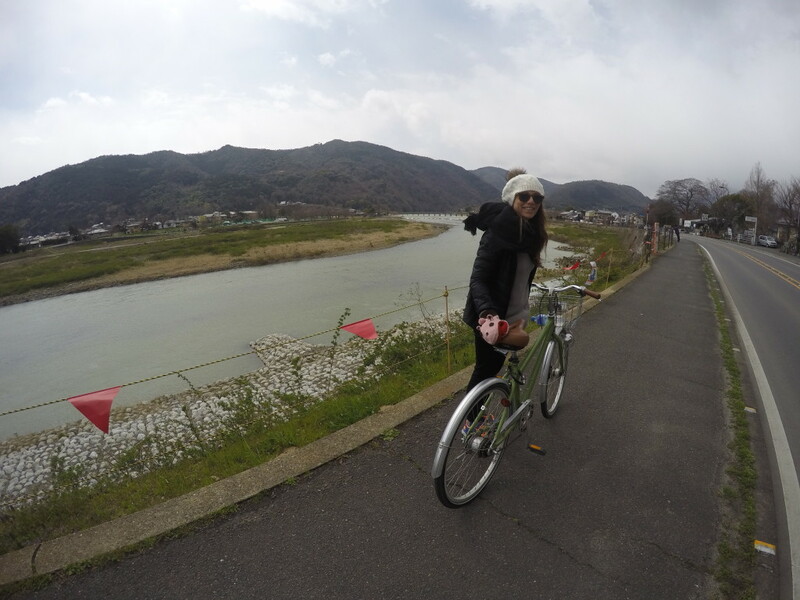 Biking in thirty-degree weather to Arashiyama. As we were crossing the Togetsu-kyo Bridge in Arashiyama near the main street area, it started to rain and hail (so fun). This is just before that happened. 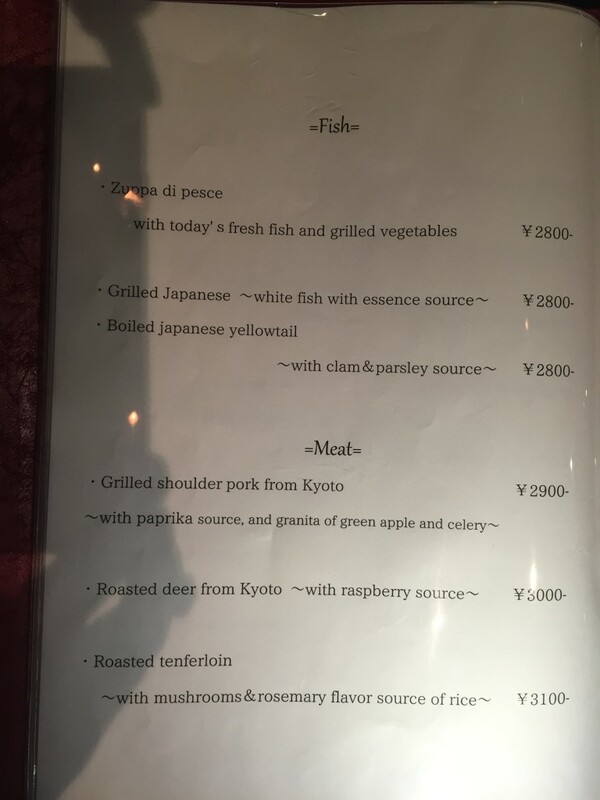 The menu which we couldn’t understand a word of. Thank goodness for photos that are semi descriptive. 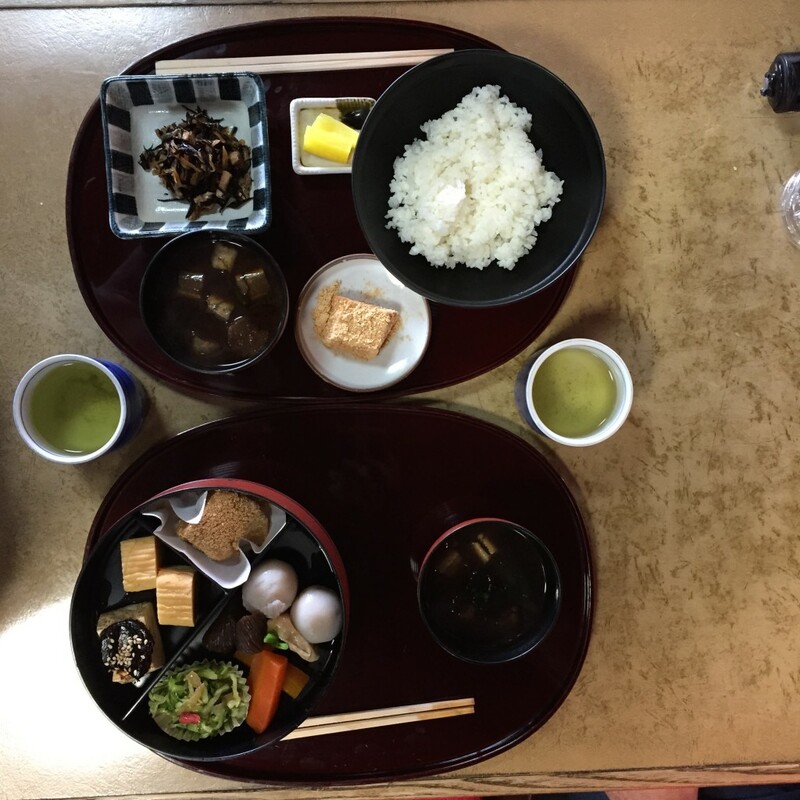 We ate a very traditional meal, but it was very bland, nonetheless, lunch was an experience. This is part 1. 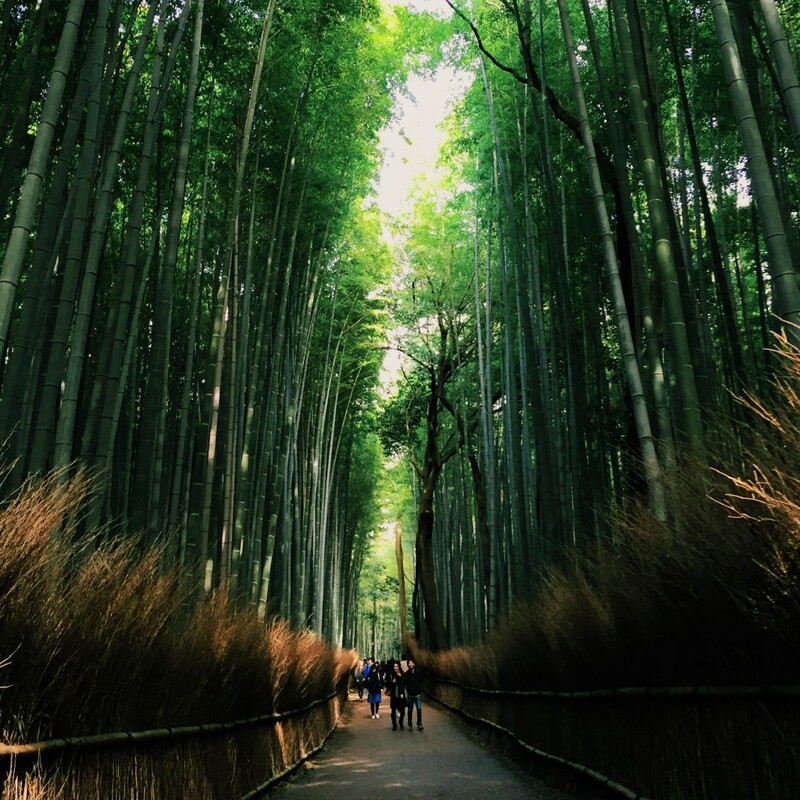 As the rain and hail stopped we found our way into the Bamboo Forest— this place was absolutely magical and enchanting! 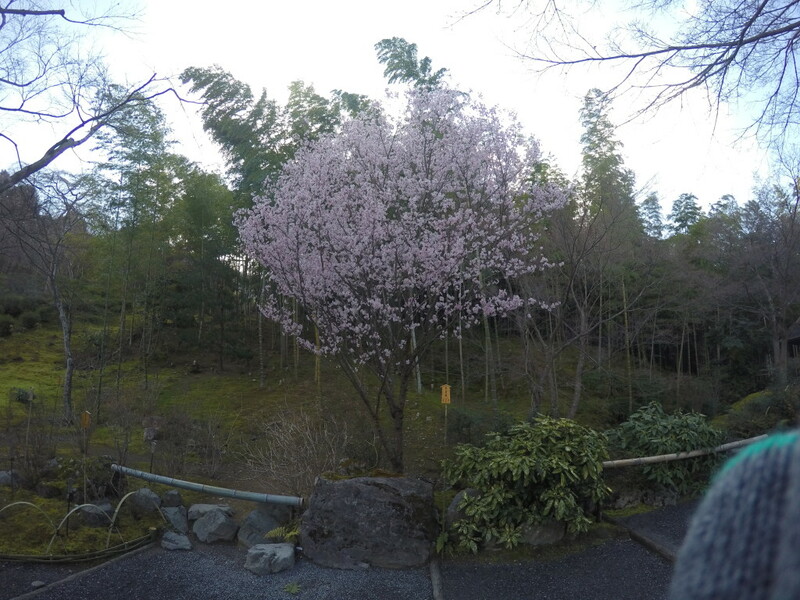 We meandered through the forest until we found Tenryu-ji Temple, which had the most beautiful garden and lots of newly budding cherry tree blossoms. 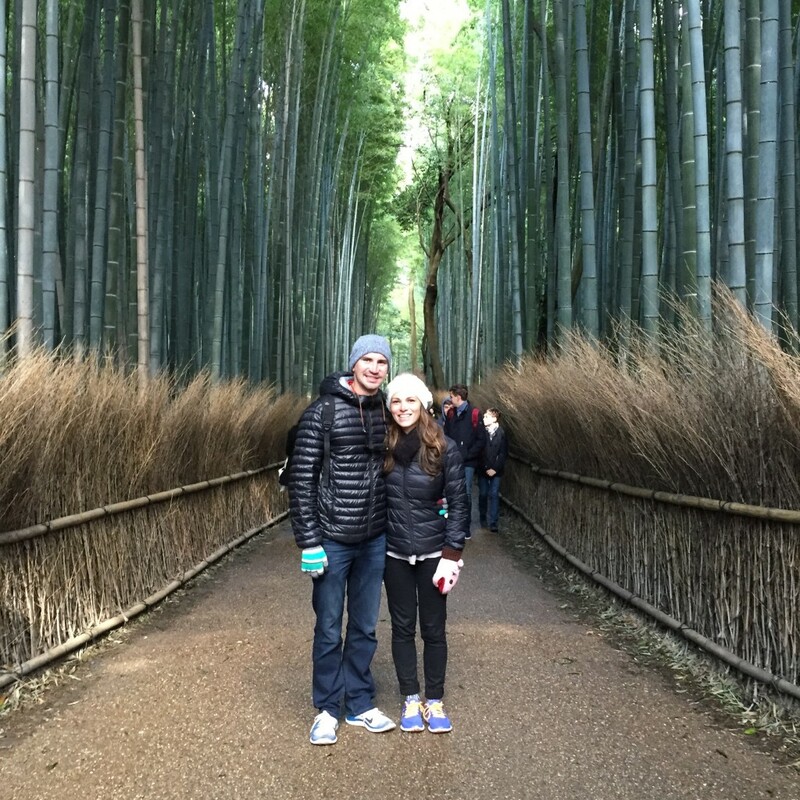 As the rain and hail stopped we found our way into the Bamboo Forest— this place was absolutely magical and enchanting! 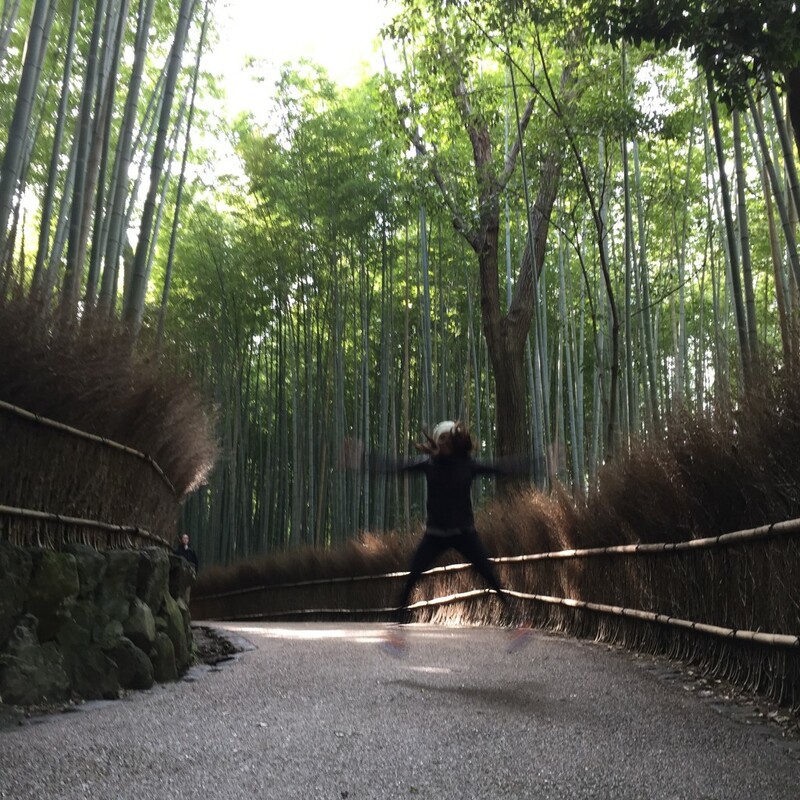 Jumping Jaxy—in the Bamboo Grove in Arashiyama. 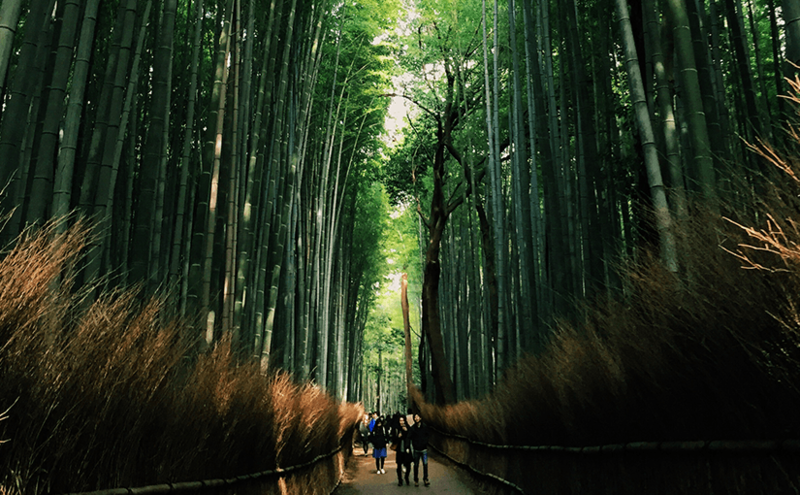 Team shot in the Bamboo Grove/Forest. 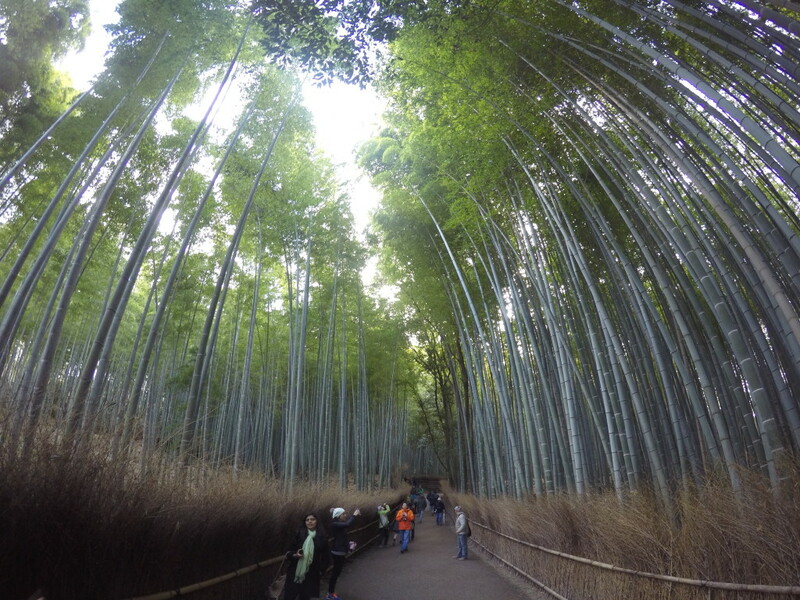 Go pro shot of the bamboo. 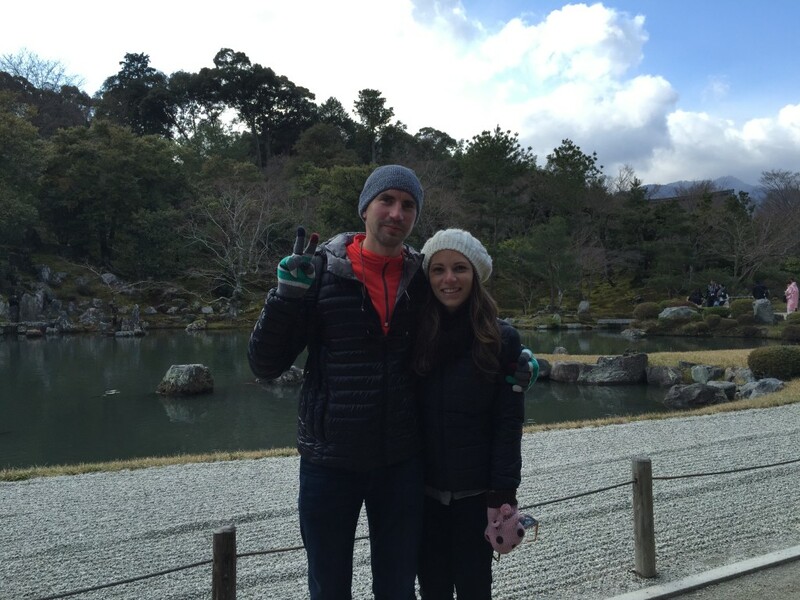 Us in front of Tenryu-ji Temple. Us in front of the koi fish pond. 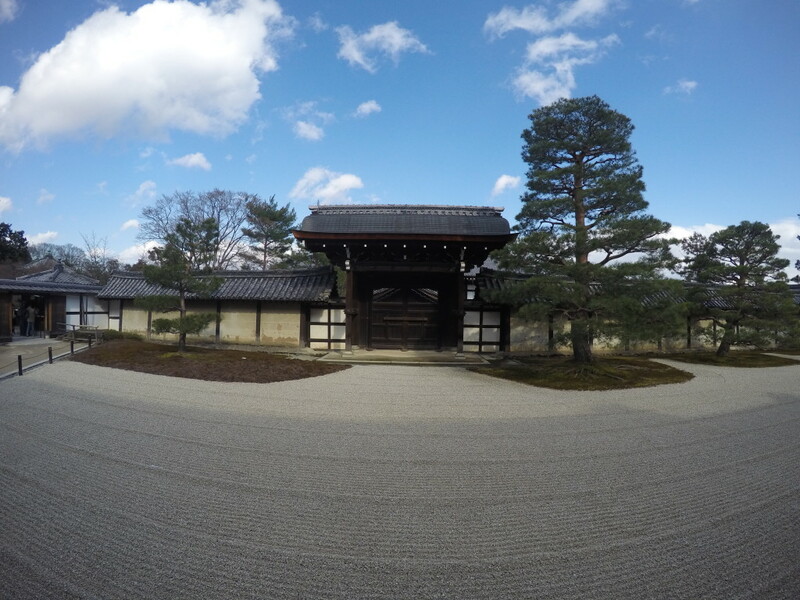 The rock garden in front of Tenryu-ji Temple. 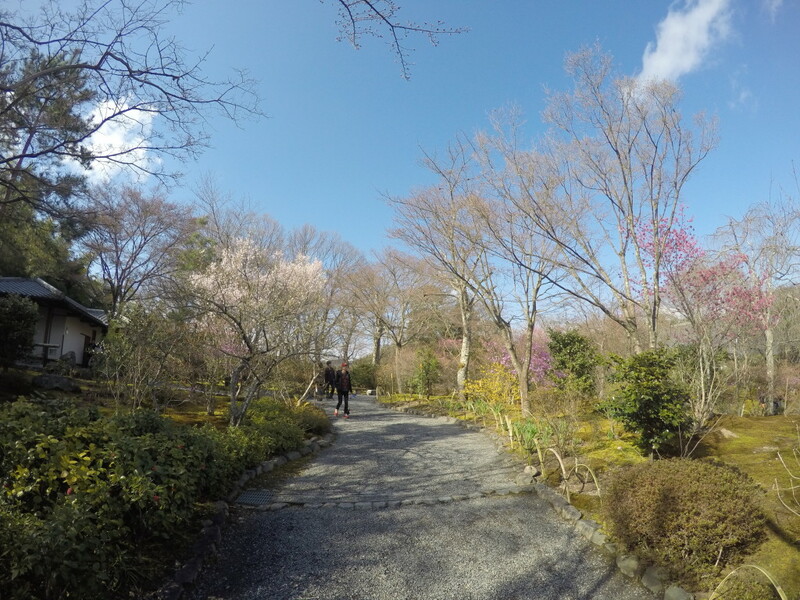 The most magnificent garden filled with budding cherry blossom trees. 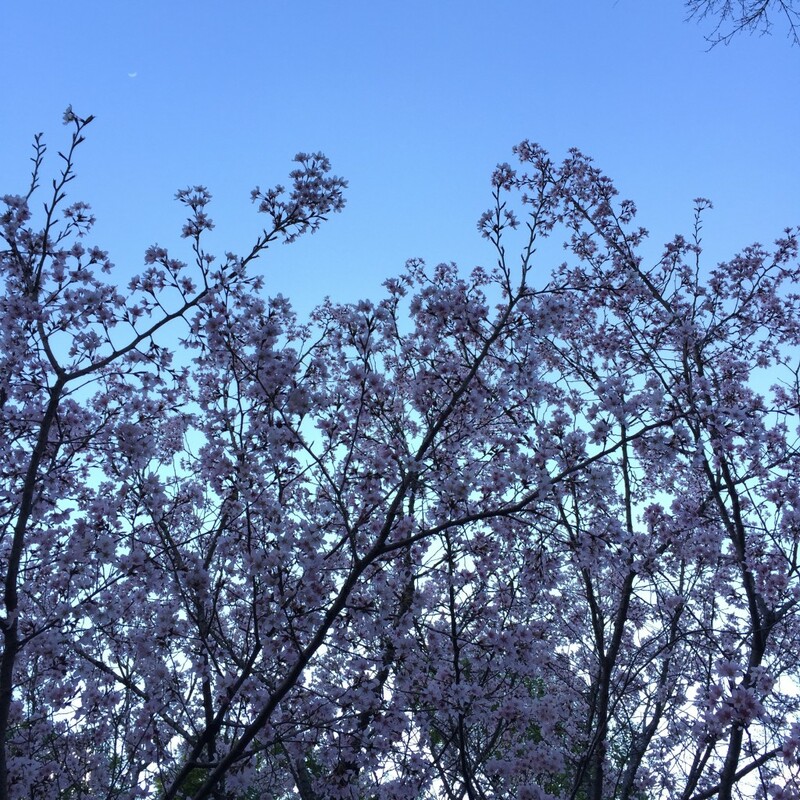 Spring is here apparently—its cherry blossom season. Finally! Cherry Blossom season coming to fruition. 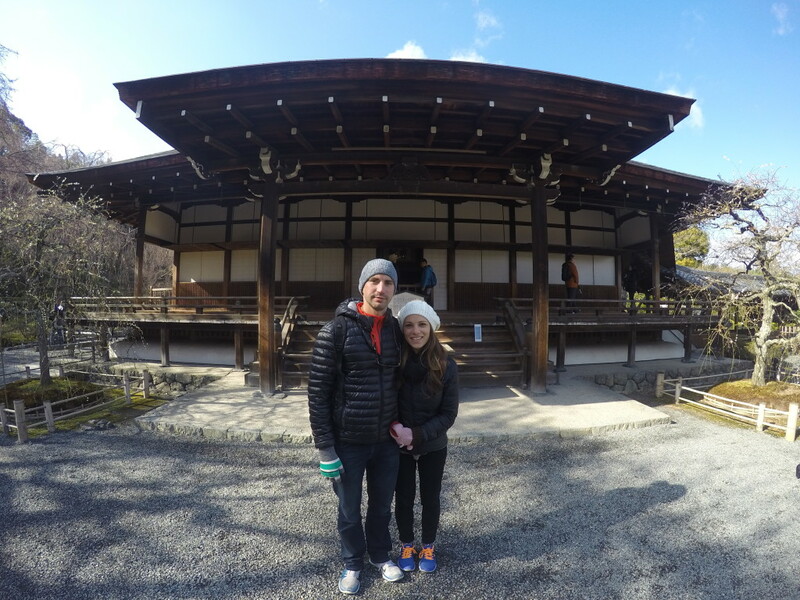 We took lots of photos and then got back on our bikes to go to the Arashiyama Monkey Park Iwatayama. 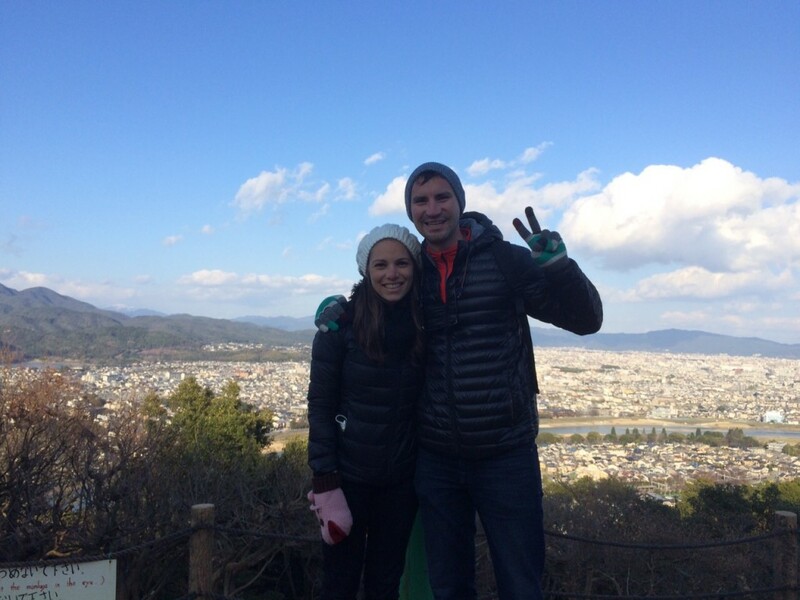 We climbed up a hill for a good twenty minutes, learning trivia about monkeys along the way, until we arrived at the top where we could see panoramic views of all of Kyoto. On the hill there are about 200 monkeys roaming freely. The monkeys all have red faces and butts because their blood shows through their skin. They all looked like they were freezing by the way they sat huddling, perched up on various things. 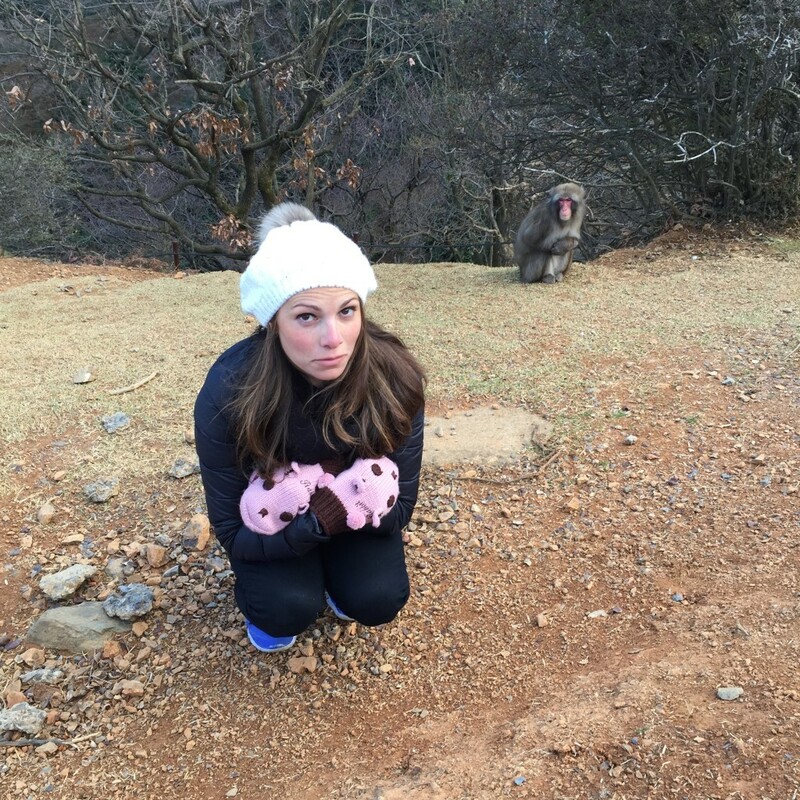 There are a few monkey guards who keep the monkeys from charging people (which happens every now and then) by running at them and barking—unique approach. 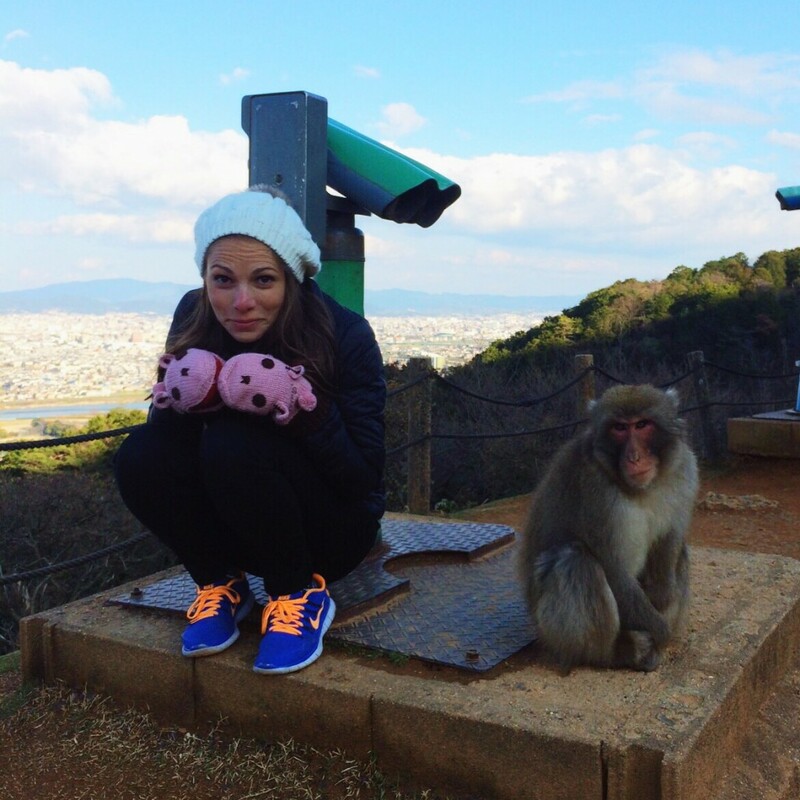 Daniel and I posed for a few photos amid the city views and the monkeys before climbing down the mountain. 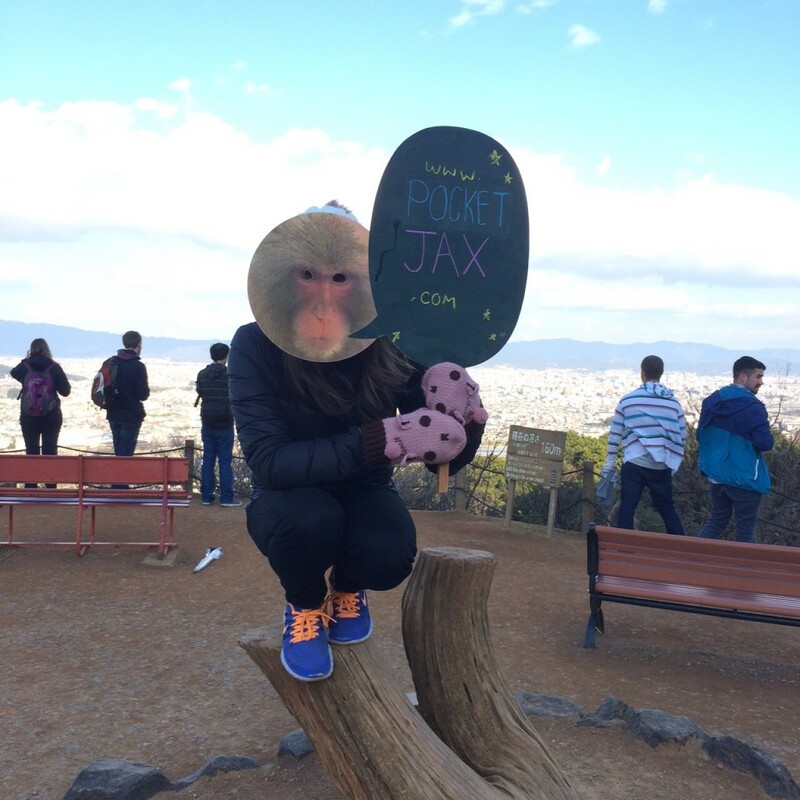 Monkey see monkey do. But I actually sit like this, so I’m not sure who is copying who. 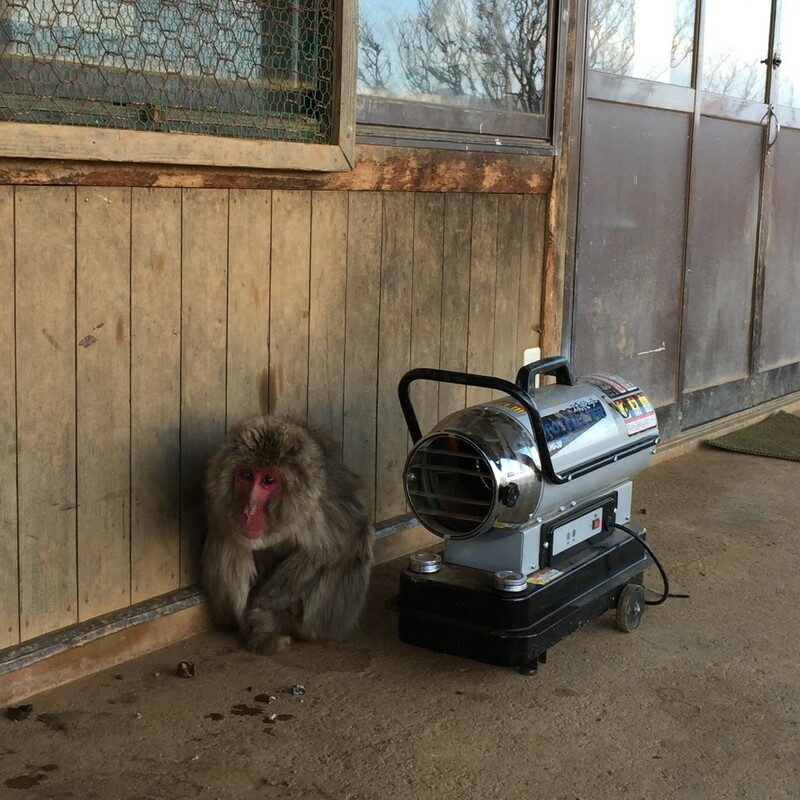 This is GRANDMA—the oldest monkey at the park—you can tell she’s old because she is skinnier, less fluffy, and more worn down than the rest—is 35 years old (the average age for this kind of monkey is 30) and appeared to be smarter than the rest because she was sitting at the base of an outdoor heater. Daniel and I posed for a few photos amid the city views and the monkeys. 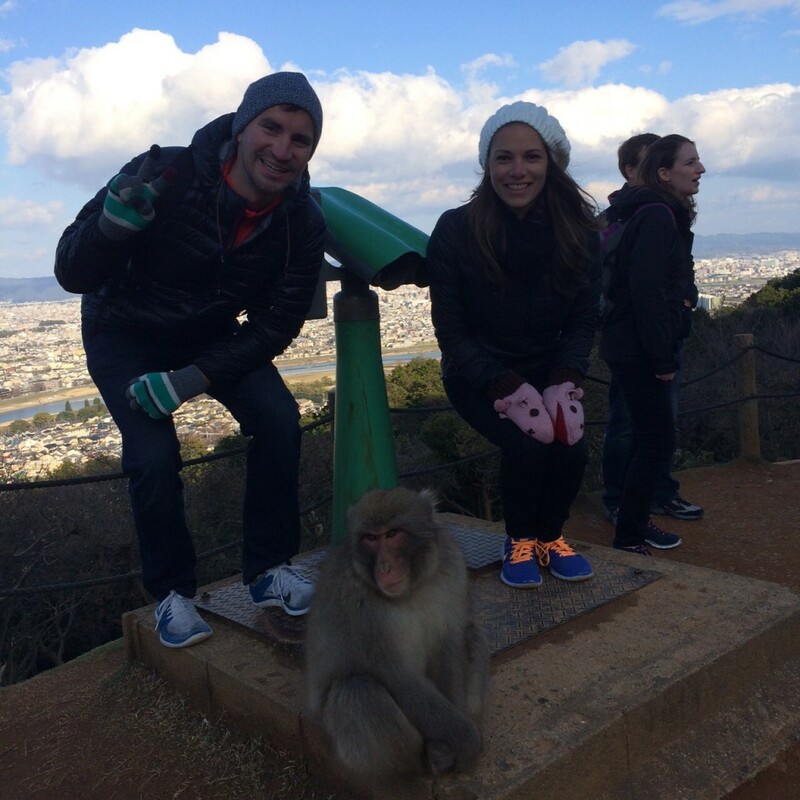 Unreal Kyoto panoramic views from the monkey park. We got on our bikes and started riding as the sun disappeared behind the mountain. About 20 minutes into our ride I hit a curb the wrong way and went flying—next thing I knew I was on the floor with the bike behind me. I freaked myself out and started crying. Daniel came over to hug me, asked if I was okay, and then told me we could fix my jeans. At that point I looked down and realized the fall had shredded my jeans open, this was when I actually started to cry (sad but true). Through my torn jeans we could tell that I was bleeding a bit, but couldn’t really access much of my skin. Daniel found a bike store about three shops away from us (pure luck) and we hobbled over. The two guys running the shop spoke 0 English. They saw I had been crying, saw my shredded jeans, and tried to ask Daniel what happened. They were able to communicate with each other by using Google Translate (so amazing). Eventually Daniel got on the phone with someone’s wife who was translating in English and Japanese for everyone. I called he hotel to see if they could arrange to get the bikes—because we couldn’t fit them into a taxi—and they couldn’t have been sweeter or more helpful. Between the hotel and the bike shop something was worked out. While this was going on, one of they guys at the bike shop ran down the street to bring us hot chocolate because it was freezing. So nice! They called us a cab and we went back to the hotel. Despite not being able to exchange a word in a common language, this man was a complete angle to me. He even ran down the street to bring us hot chocolate because it was freezing out. So nice! As I was cleaning myself up in the room, the doorbell rang. I opened the door to two very sweet staff members who brought me big Band-Aids, gauze, sterilizing agent, and water as a “sympathy gift”. I was so touched. 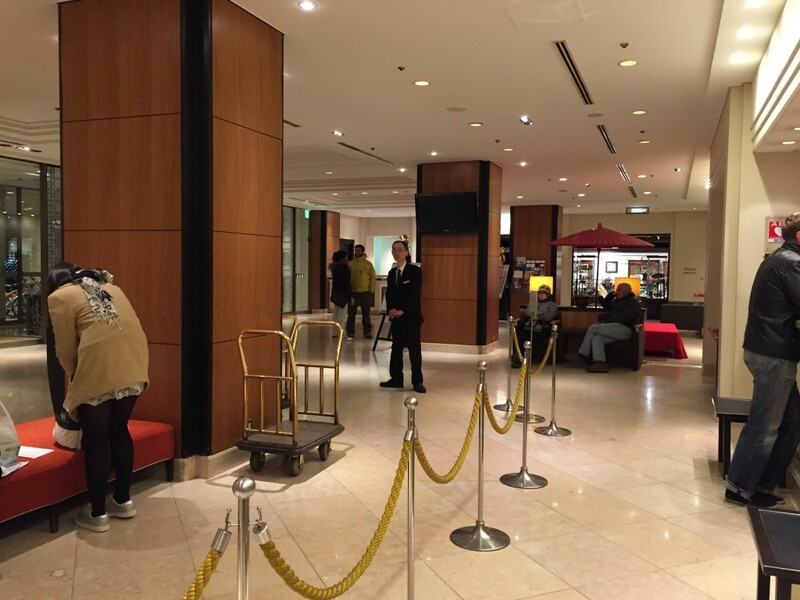 Before we left for dinner, we went down to the lobby to thank the manager. He handed us a bag, which he told us was “a sympathy gift from the men at the bike shop”. Inside the bag were two bike lights, one that looks like a cat and one that looks like a dog. I was so deeply moved by their kindness. After all, we interrupted them, took time out of their day, and put them out, and yet they managed to give us something yet again. The kindness of people here is something I will never forget. 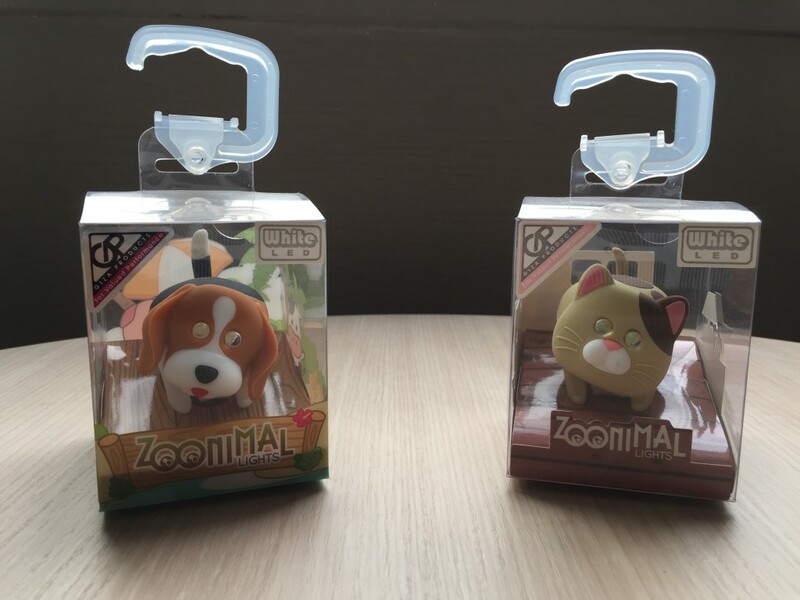 A sympathy gift from the bike store guys—cat and dog bike lights.. I was so deeply moved by their kindness. For dinner we walked to a famous restaurant called Ippudo Ramen and ordered delicious vegetarian ramen. Daniel and I both highly recommend this place! 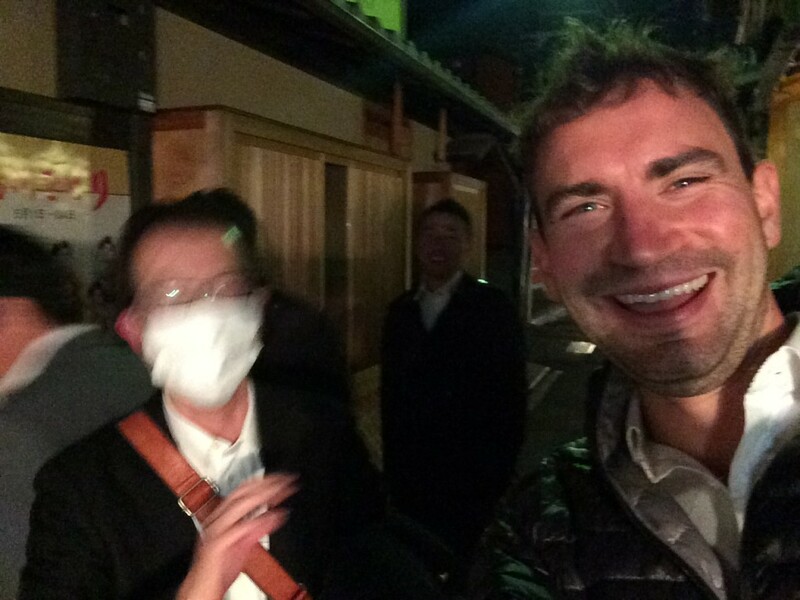 After dinner we wandered around the very empty and very quiet streets for a bit (all of Kyoto at night feels like a tea ceremony because no one speaks) before heading back to the hotel to sleep. 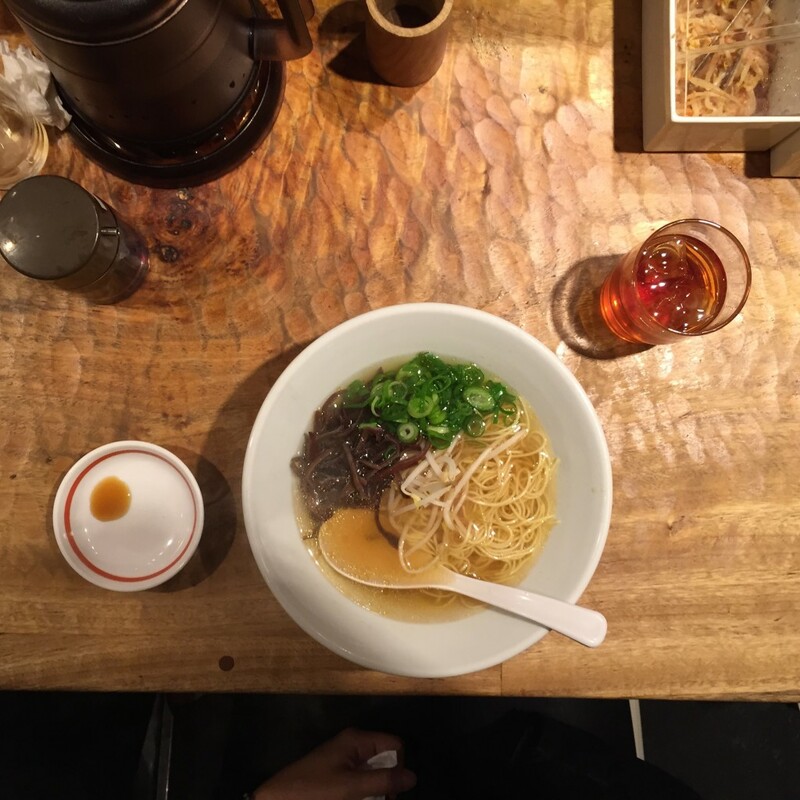 Shotgun restaurant style at Ippudo Ramen. The most delicious vegetarian ramen. Daniel and I both highly recommend this place! Thursday we woke up early (even though it was so difficult to get out of bed) and went back to Boulangerie for breakfast. We sat next to Mats and Robert and exchanged stories about the day before. Breakfast was delicious, scrambled eggs with unlimited breads and coffee. 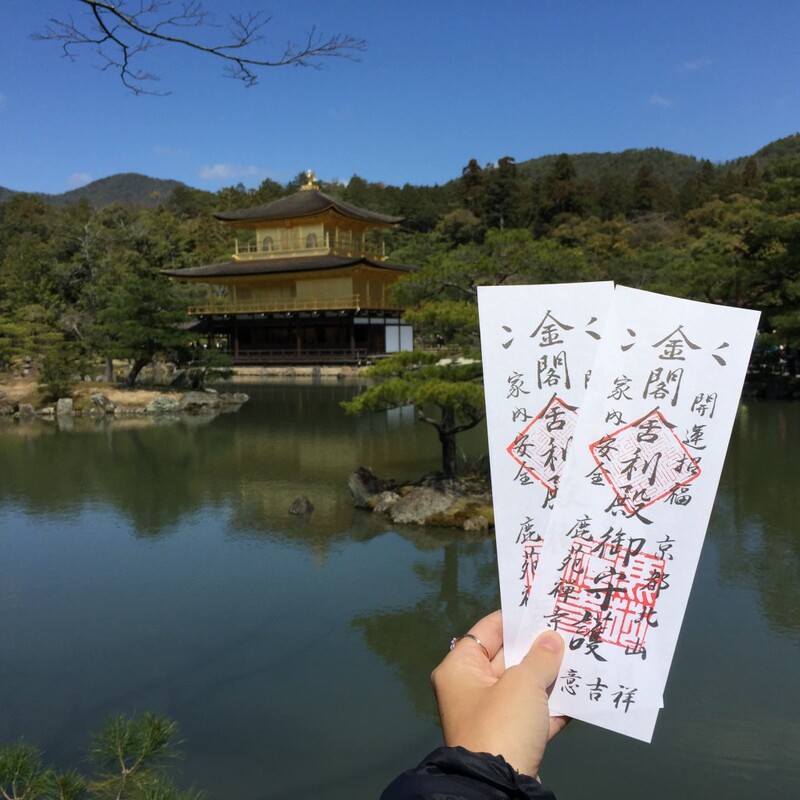 Daniel and I took the bus to Kinkaku-ji, Kyoto’s famed “Golden Pavilion”. The original building was built in 1397 and was converted into a temple, but then in 1950 a monk consummated his obsession with the temple by burning it to the ground—weird. In 1955 the temple underwent a full reconstruction—the temple and its garden were majestic and ridiculous. 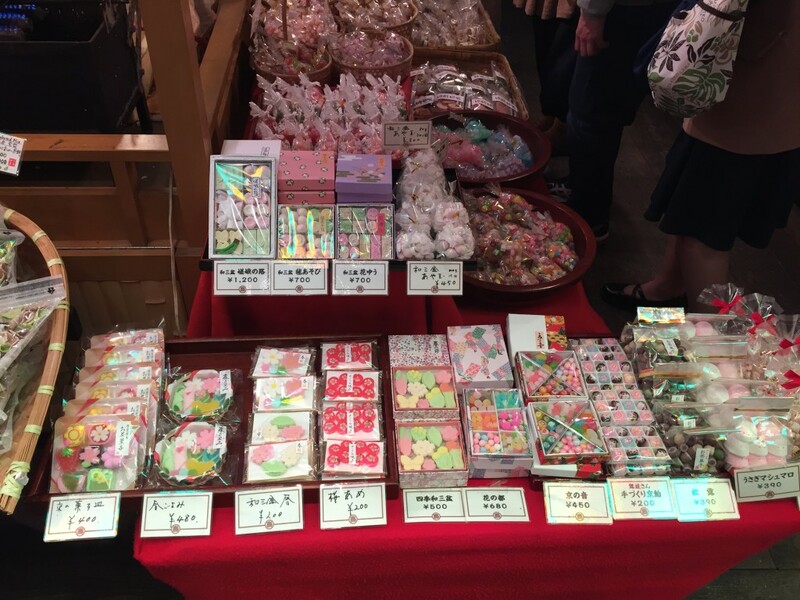 On our way out, we tried various types of mochi snacks and green tea (some with gold leaf inside). 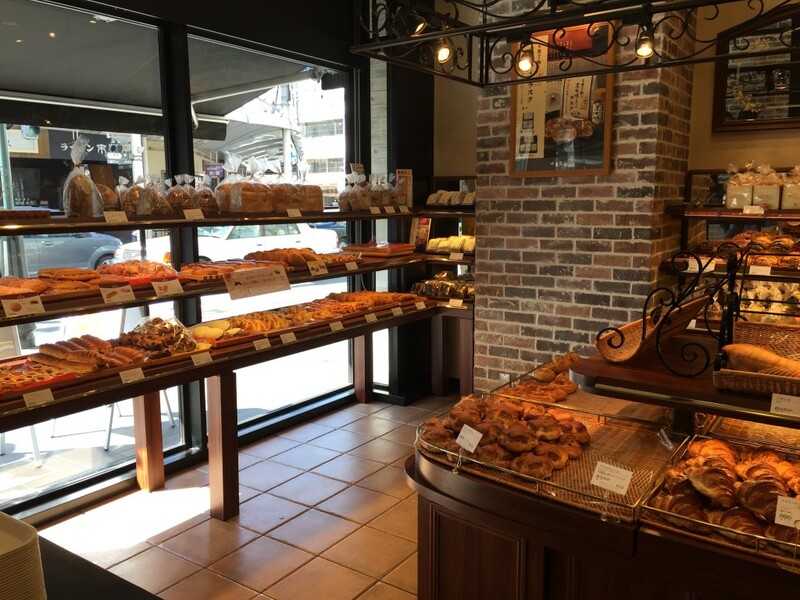 The pastry section of Boulangerie. So yum! 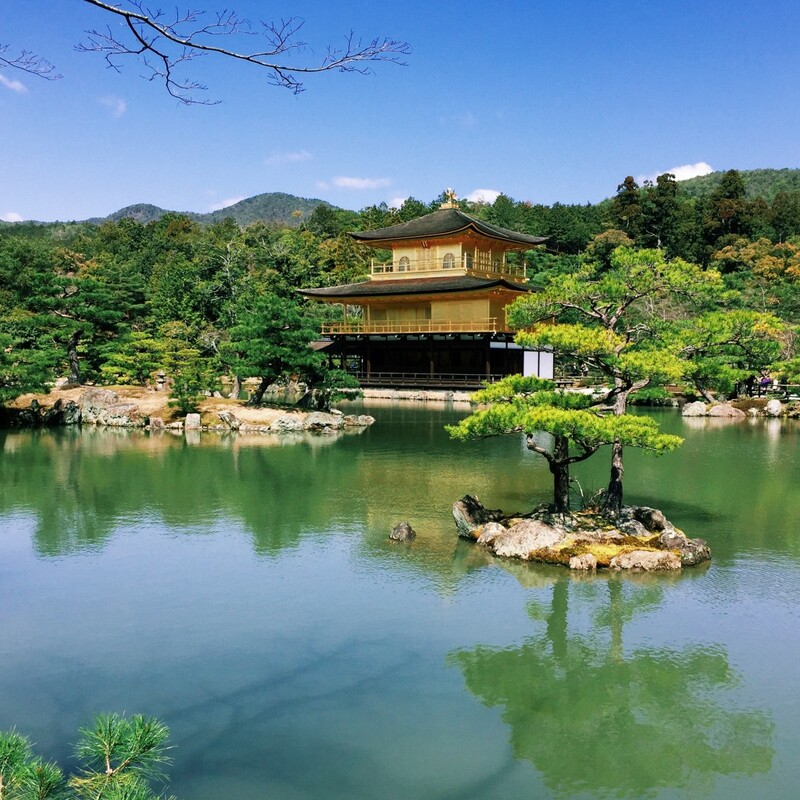 Kinkaku-ji, Kyoto’s famed “Golden Pavilion”. The original building was built in 1397 and was converted into a temple, but then in 1950 a monk consummated his obsession with the temple by burning it to the ground—weird. In 1955 the temple underwent a full reconstruction—the temple and its garden were majestic and ridiculous. I liked the tickets so I took this shot—Daniel told me it was silly…..
…one minute later as we’re taking this photo the woman standing next to us puts her tickets out. Photo jacking. 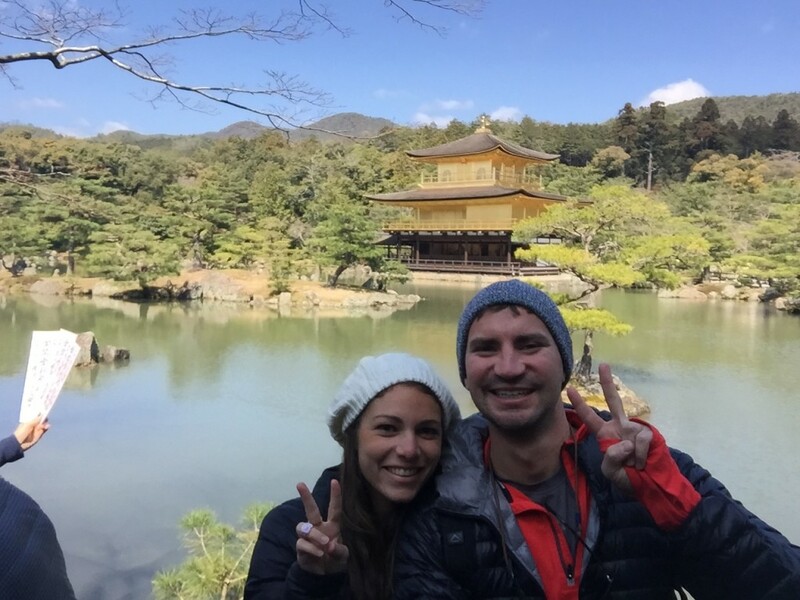 Us in front of Kinkaku-ji. We offered to take a group shot of these boys and instead of letting us take it, they asked us to be in it, and still made one of their friends take it. 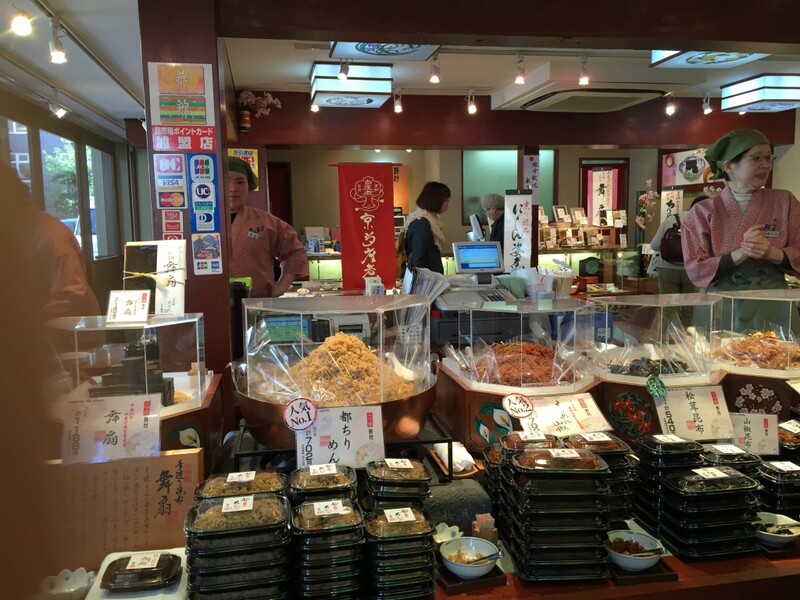 For lunch we went to Nishiki Market aka Kyoto’s Pantry to check out all of the strange and exciting food. We bought some weird cheese stick but didn’t like it. Then we tried Onigiri, the triangle sushi rice wrapped in seaweed with poppy seeds, and it couldn’t have been more delicious! We spent around forty-five minutes walking up and down the pathway, checking out the different foods at the different stalls. 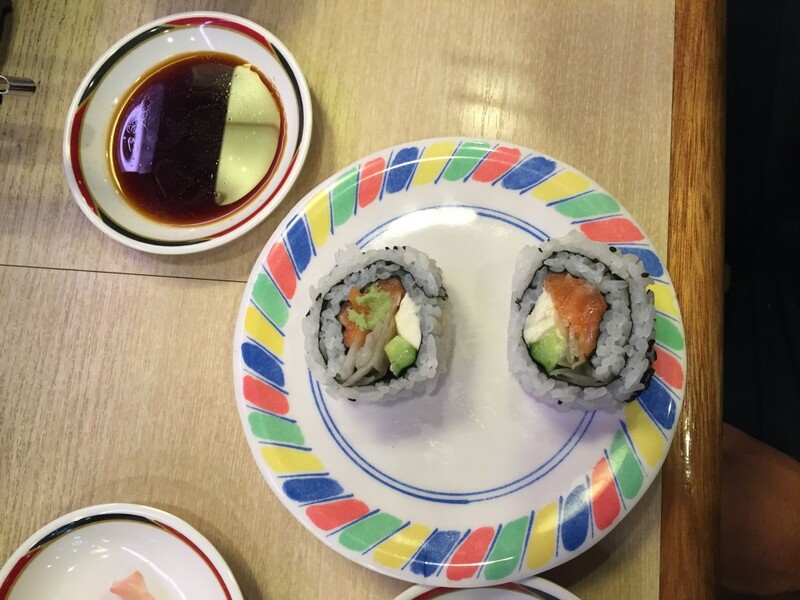 Eventually we ended up at Iyomata, a hole in the wall sushi-only restaurant and had some tasty and authentic sushi. 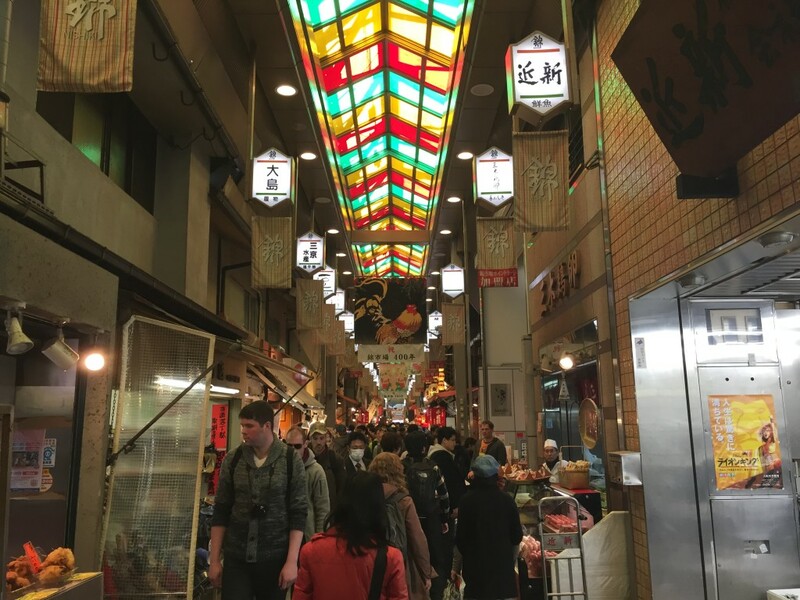 Nishiki Market has these colorful glass windowed ceilings that are different than every other inclosed outdoor area. 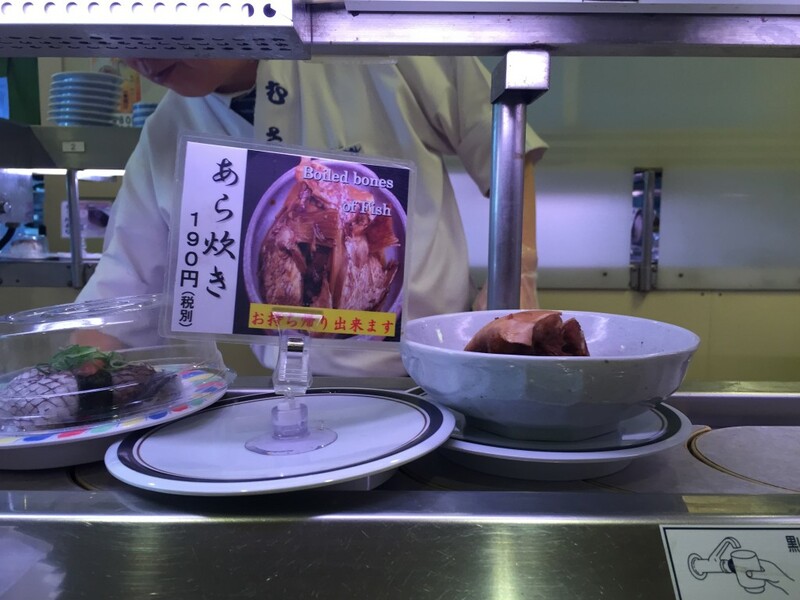 Random foods at Nishiki Market. 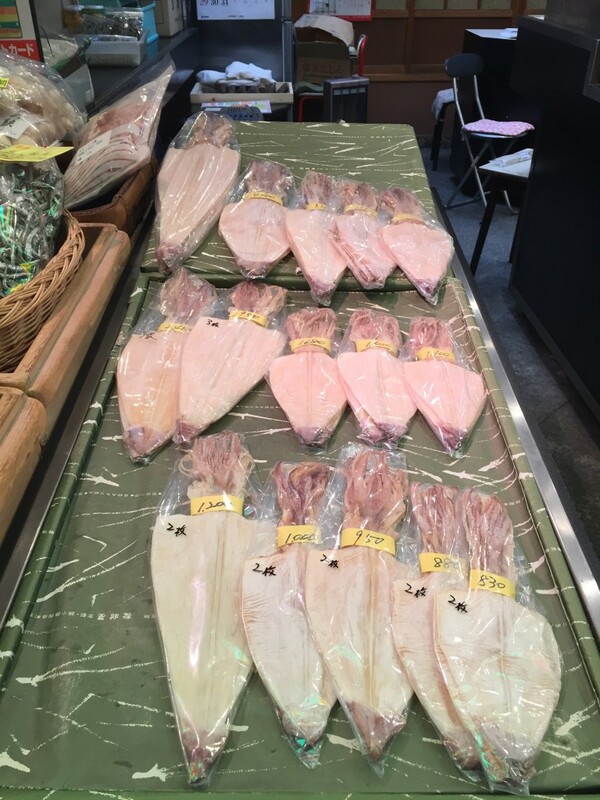 Dried, dehydrated, and flattened squid shop. 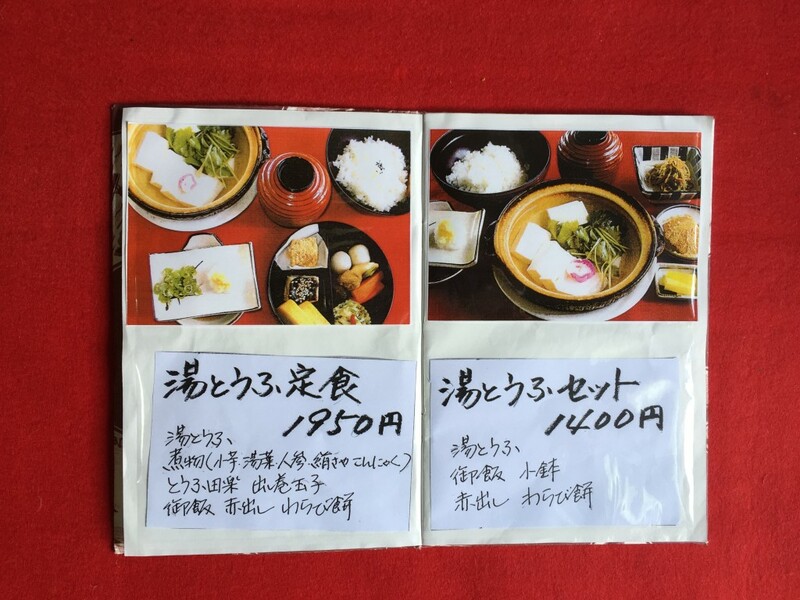 Iyomata, a hole in the wall sushi-only restaurant. Tasty sashimi! 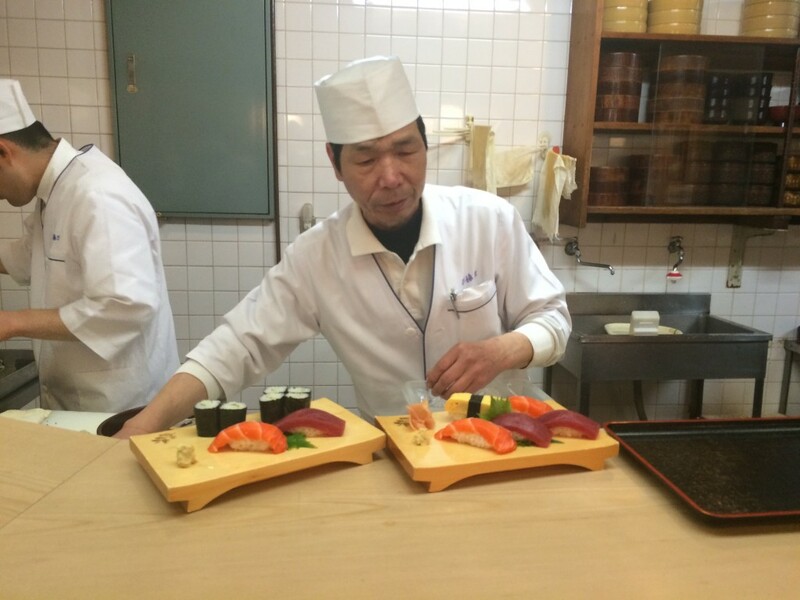 The chef behind the sushi. 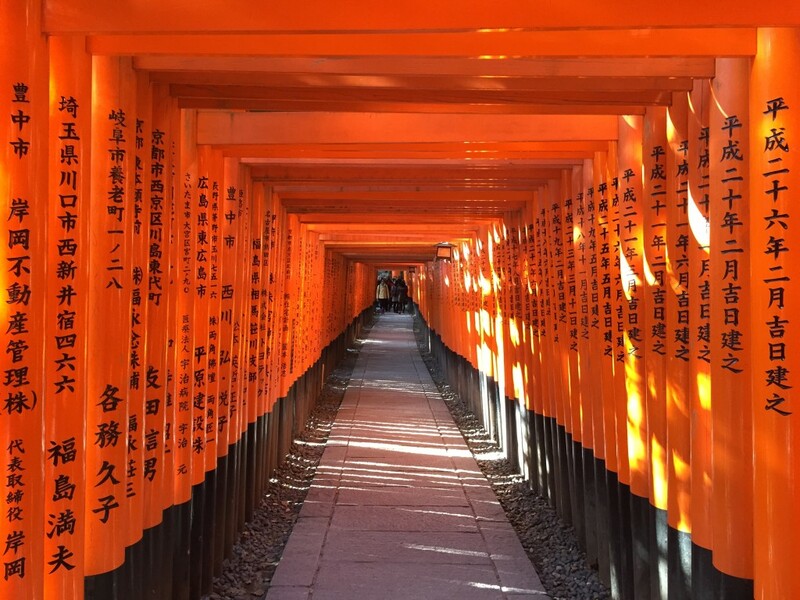 In the afternoon we went to Fushimi-Inari-Taisha Shrine to check out the majestic orange gates. 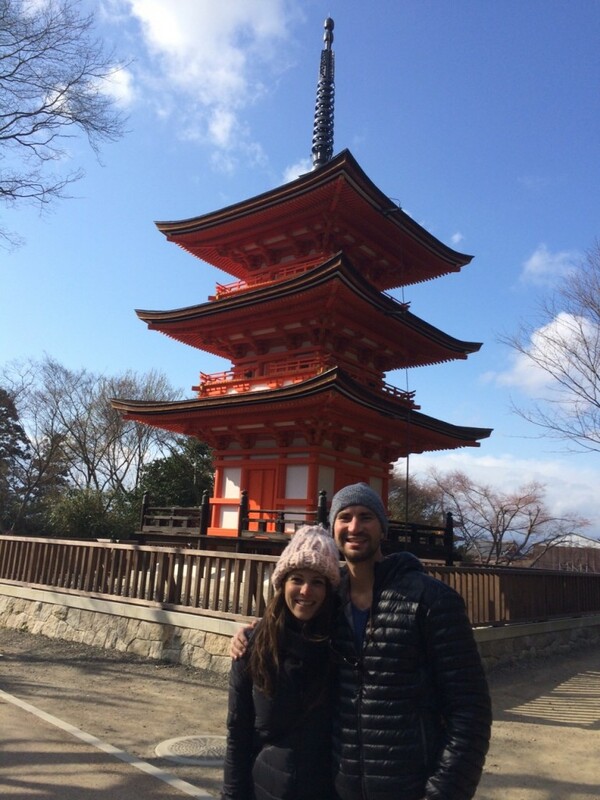 We learned that the shrine itself is dedicated to the g-ds of rice and sake (we were big fans from the start) and is populated with dozens of stone foxes; the fox is considered to be the messenger of Inari, the g-d of the rice harvest. 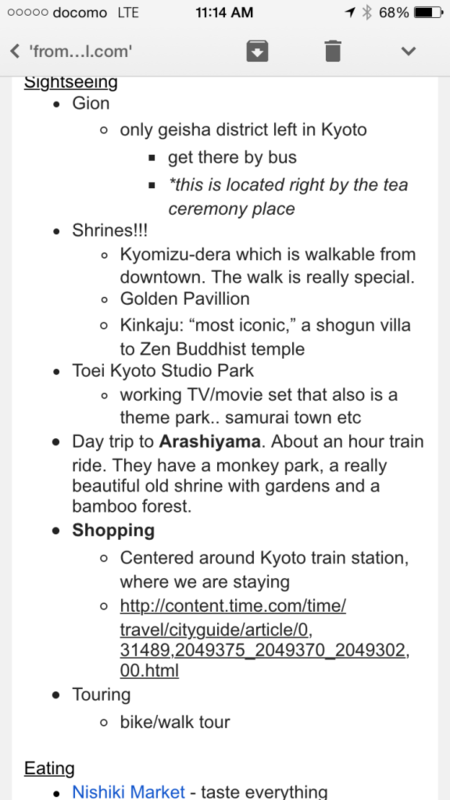 We hopped onto the back of some American families tour and learned a bit about the shrines before leaving. This shrine was totally worth all they hype! It’s a miracle I was able to get this shot so far away with no one in it. 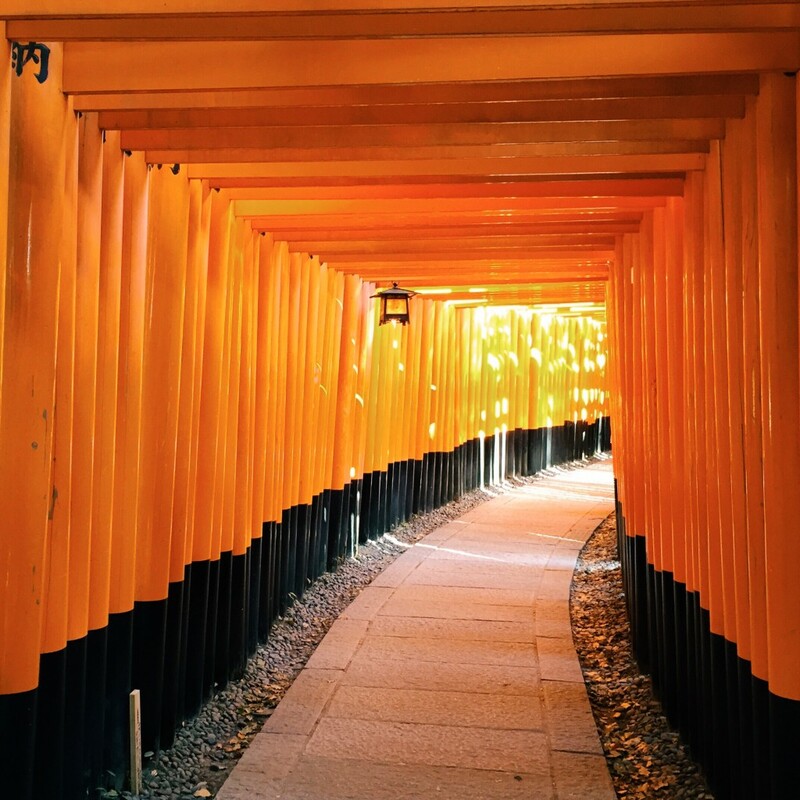 This shrine itself is dedicated to the g-ds of rice and sake (we were big fans from the start) and is populated with dozens of stone foxes; the fox is considered to be the messenger of Inari, the g-d of the rice harvest. 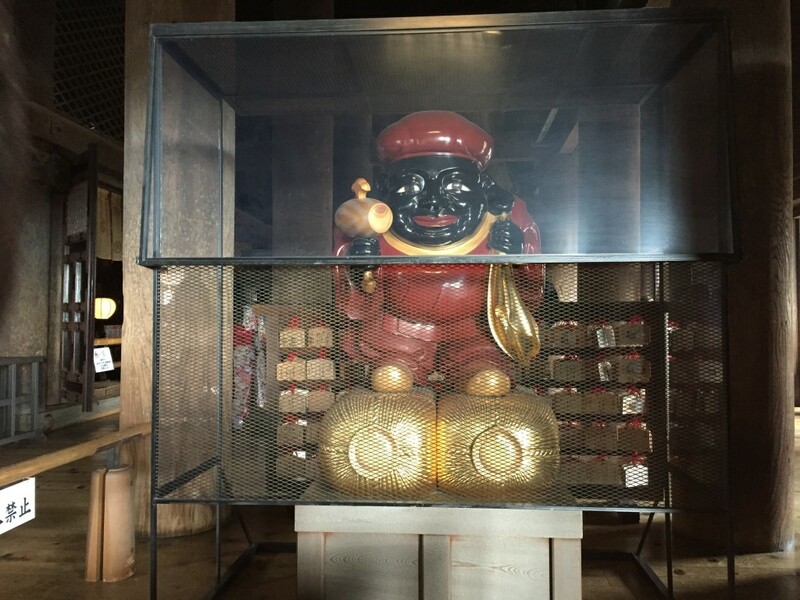 We hopped onto the back of some American families tour and learned a bit about the shrines before leaving. This shrine was totally worth all they hype! 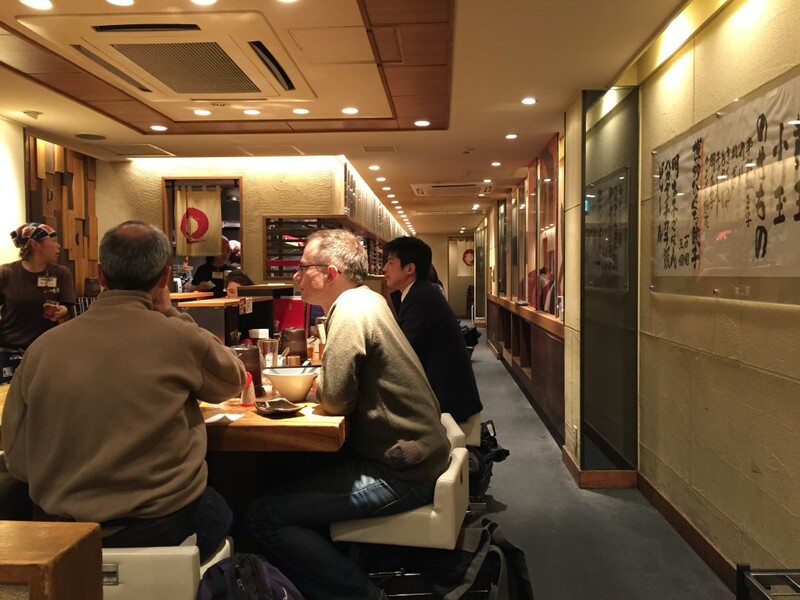 Daniel downloaded an app called Bean Hunter, which tells you about all the best local coffee shops in a city, so on the way out of Fushimi-Inari-Taisha Shrine, we went to a local place known as Café Goo. 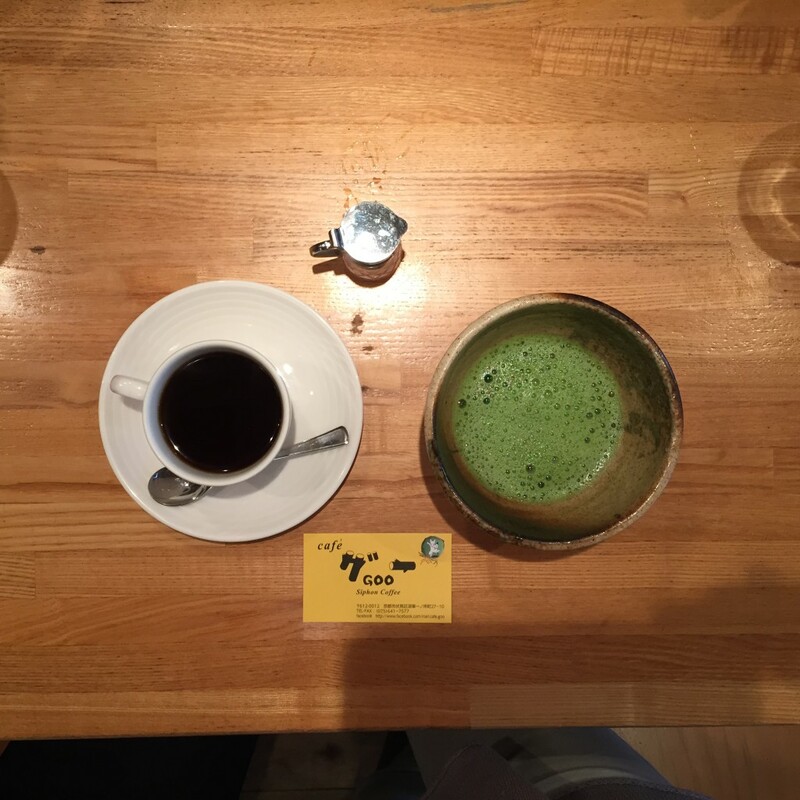 We ordered a coffee and a green tea (considering how unpleasant the coffee has been for the last month and a half I wasn’t all too excited about taking the risk on ordering another bad cup). Turns out the coffee here was excellent—smooth and strong without any bitterness—and the owner couldn’t have been sweeter. 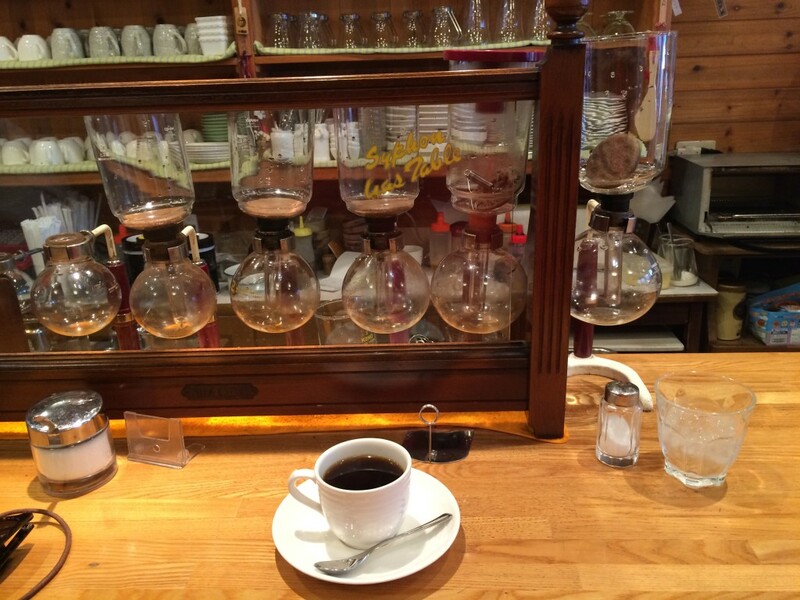 How they do coffee at Cafe Goo! We ordered a coffee and a green tea. The coffee here was excellent—smooth and strong without any bitterness—and the owner couldn’t have been sweeter. On the walk back to our hotel in Kyoto. I headed to the outdoor market to look for a pair of pants (to replace my shredded jeans) and Daniel went to the hotel to relax. 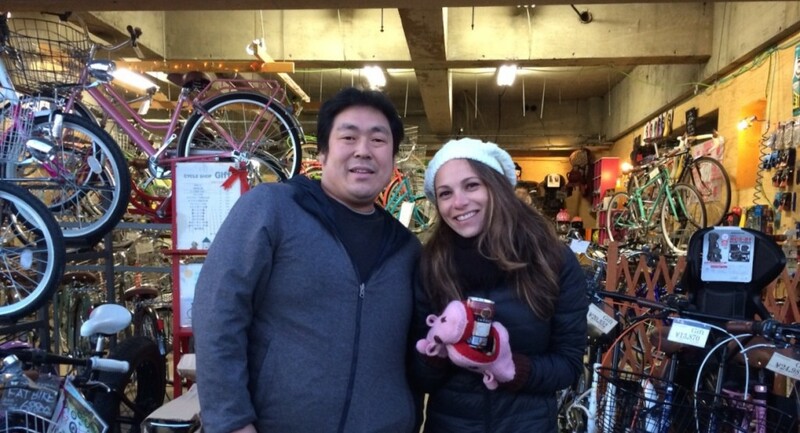 I found a store called Who’s Who and had the most fun with the cute Japanese sales associate who spoke no English. 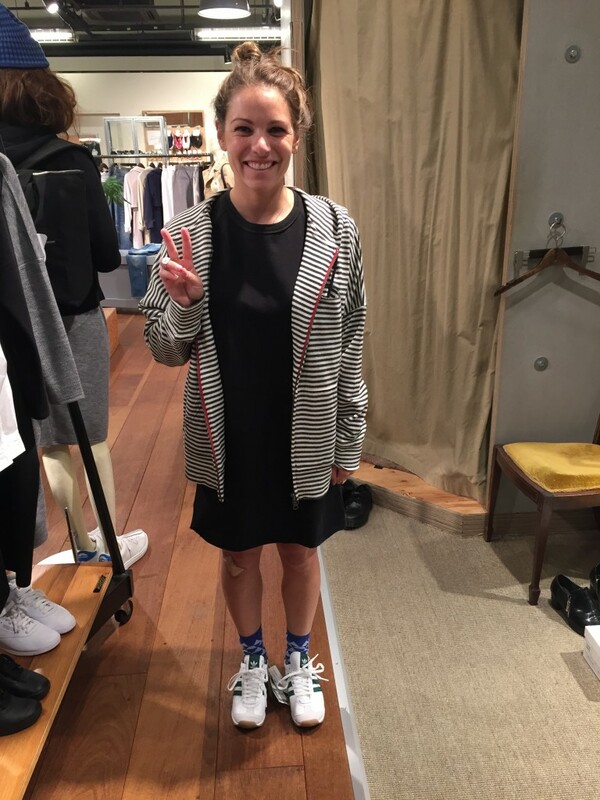 Every time I would try pants on she would bring out a different top, jacket, and pair of retro athletic shoes to try them on with. I am pleased to report I found a pretty cool pair of trousers. 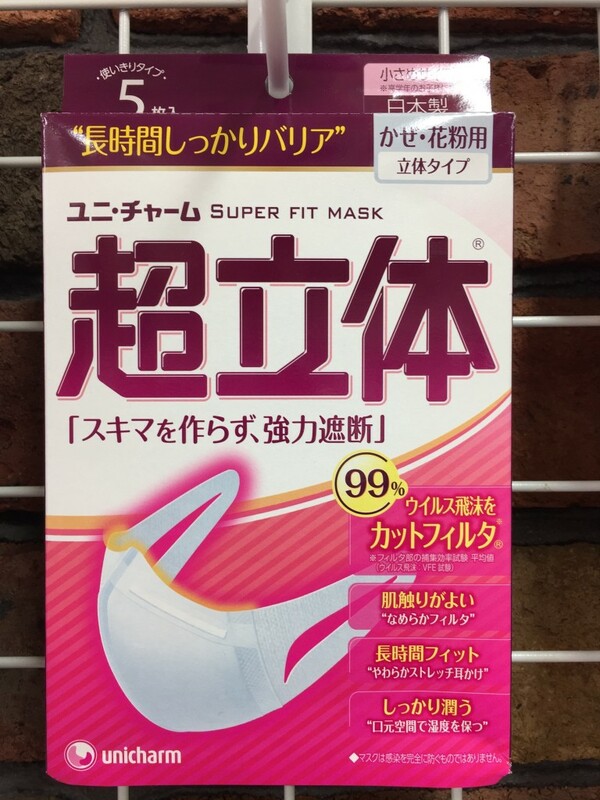 Oh—one random and interesting thing to note, in some of the stores they have “face covers” for people to wear when they try on anything that goes over their head, so as to avoid getting makeup or sweat on the clothing—strange but also not the worst thing I’ve ever heard. I found a store called Who’s Who and had the most fun with the cute Japanese sales associate who spoke no English. Every time I would try pants on she would bring out a different top, jacket, and pair of retro athletic shoes to try them on with. She even had me try on this dress, even though I told her I only needed pants. Such fun. 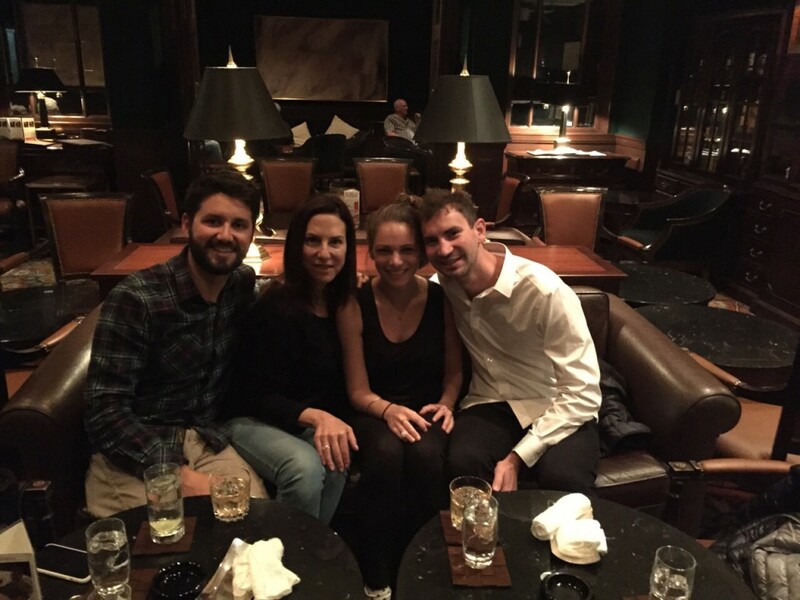 I went back to the hotel, grabbed Daniel and we met up with Brandon and Patty (amazing friends from Los Angeles) in the hotel bar. We had a drink and then Daniel and Brandon had some weird interaction with a woman dressed as a bell-boy who eventually gave them a dinner recommendation. The four of us walked to Italiana Sagra, a highly recommended Italian restaurant. When we walked in we ordered a fabulous bottle of wine and started to go over the menu. As vegetarians there wasn’t much that Daniel and I could eat but we figured we would get the grilled sea bass, and Patty decided on the same. Two minutes after ordering the nice waiter came back to tell us there is no more sea bass. Then we asked for something else and he came back a moment later to tell us that they didn’t have that either. He then informed us that the English menu we were looking at was from the year before and many of the dishes had been changed. So we requested pasta with olive oil and garlic, which they weren’t able to do. Then they told Brandon they couldn’t make the dish he wanted. We made the call to leave here and go somewhere else for dinner, but we felt bad so we ordered a bread basked which our waiter presented to us in extreme detail, before we got the bill. We decided to go back to Kappa Sushi (the restaurant Daniel and I had dinner at two nights before). 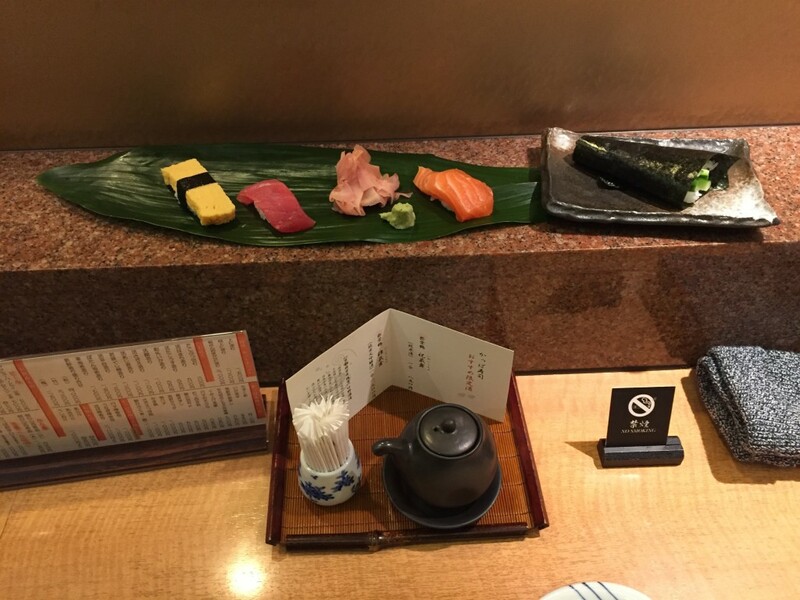 We were seated at a traditional Japanese style table and ordered more amazing sushi! 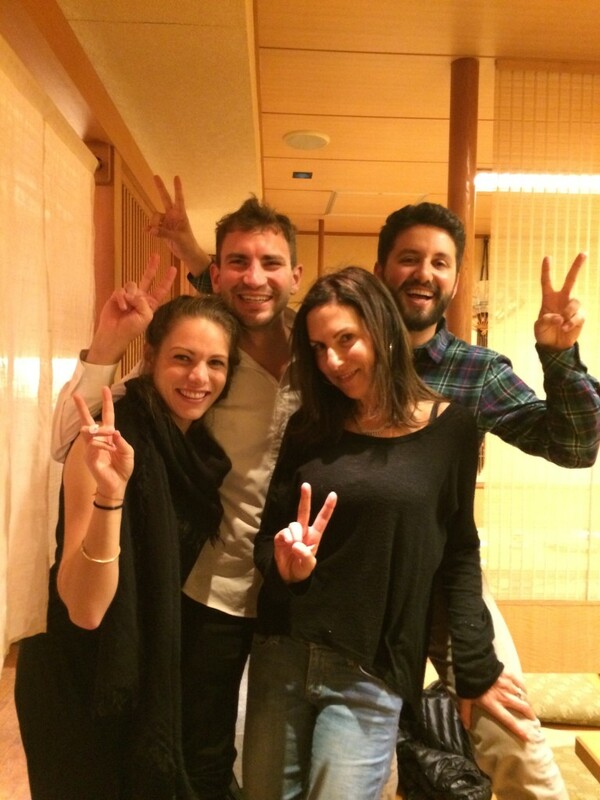 Then we all went our separate ways and decided to meet up Saturday in Tokyo. Such a fun night! In the hotel bar meeting up with Brandon and Patty for a drink before a night out in Kyoto. Traditional Japanese style table at Kappa Sushi where we ordered more amazing sushi! Group shot at Kappa Sushi! One more for good luck. Daniel asked this doctor to take a photo of Brandon, Patty and I (soon to be him too) and the man had no clue how to use the camera. So Daniel took a selfie with him. After a few miscommunications we found a different doctor to take a photo of us. Friday morning we woke up early, went to breakfast at Boulangerie, saw Mats and Robert, ate and said goodbye. 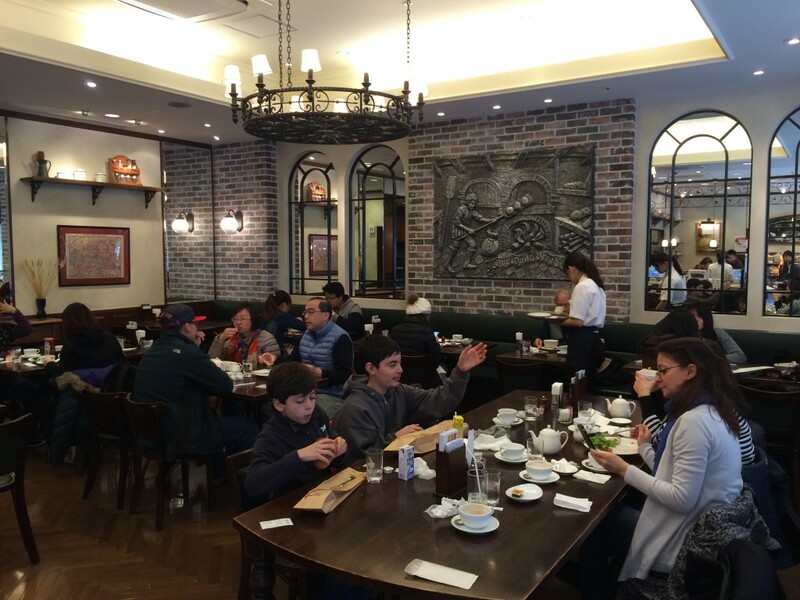 Last breakfast at Boulangerie in Toyko. 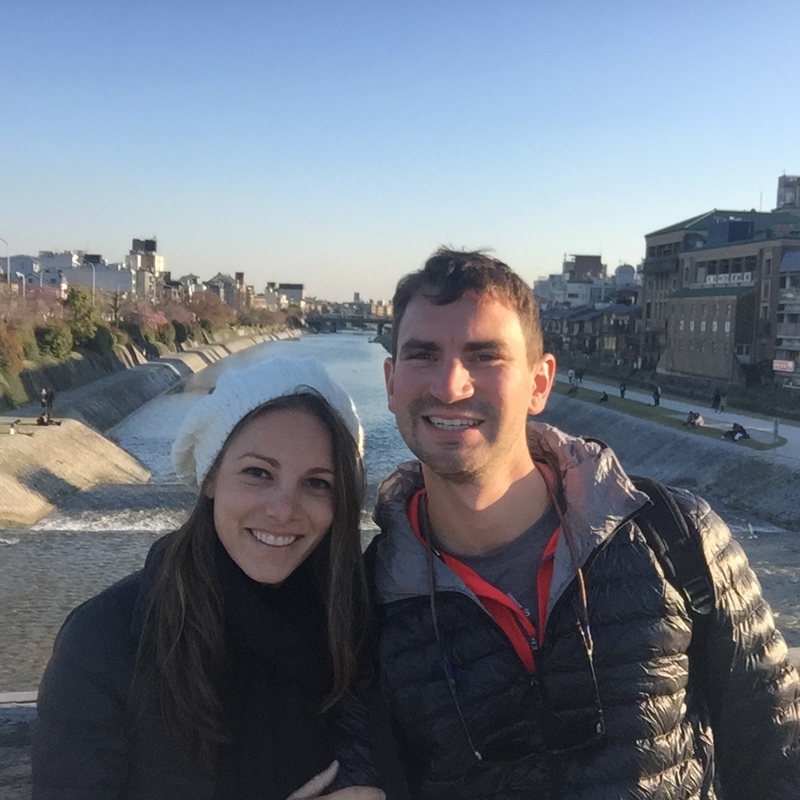 We took a cab to the Kyoto Station and met the nicest couple— originally from New York, but living in Los Angeles named Laurie and Washington—on the platform as we were waiting for our train. We chatted with them until our train arrived as we were in separate cars. 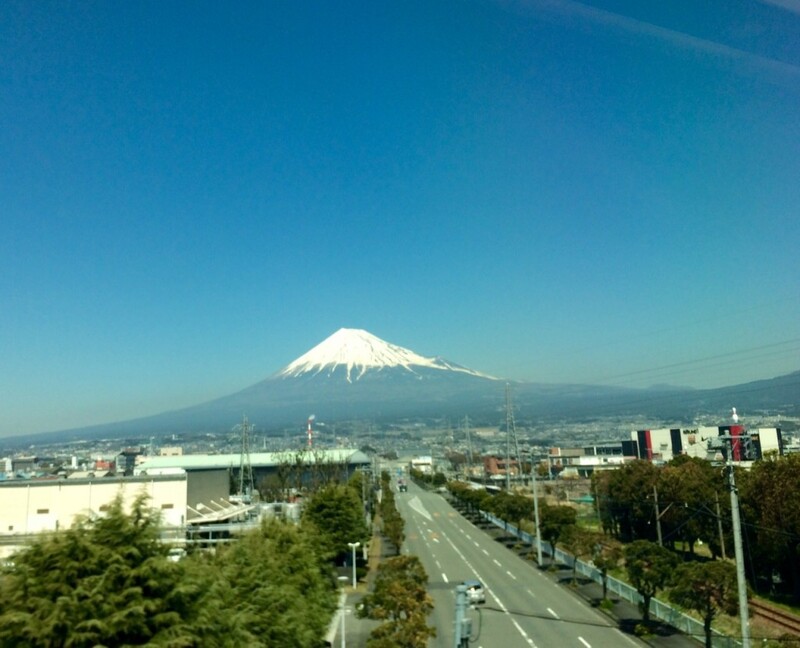 The bullet train was quick and easy, yet again, and we passed Mount Fuji on the way, which was stunning. We arrived at Odawara Station and ran into Laurie and Washington again. 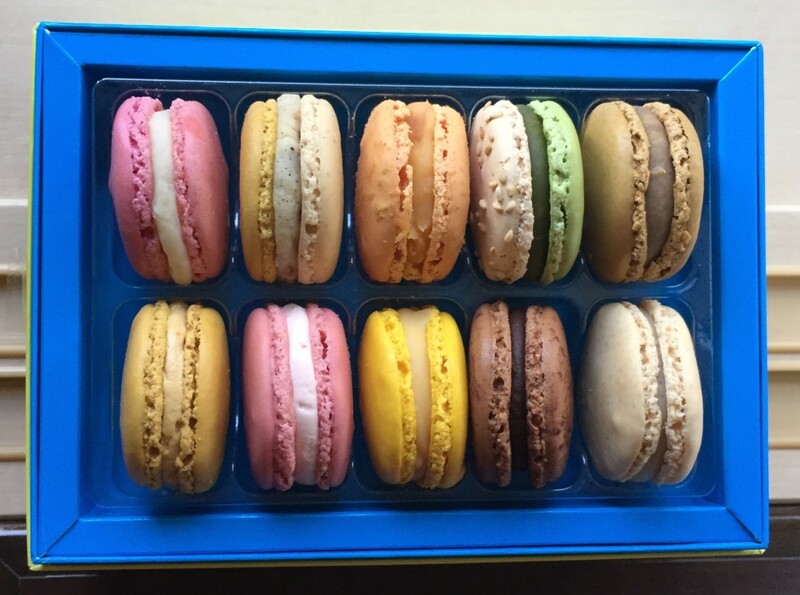 They gave us a box of Pierre Hermé French Macaroons as a gift—sweetest people ever! 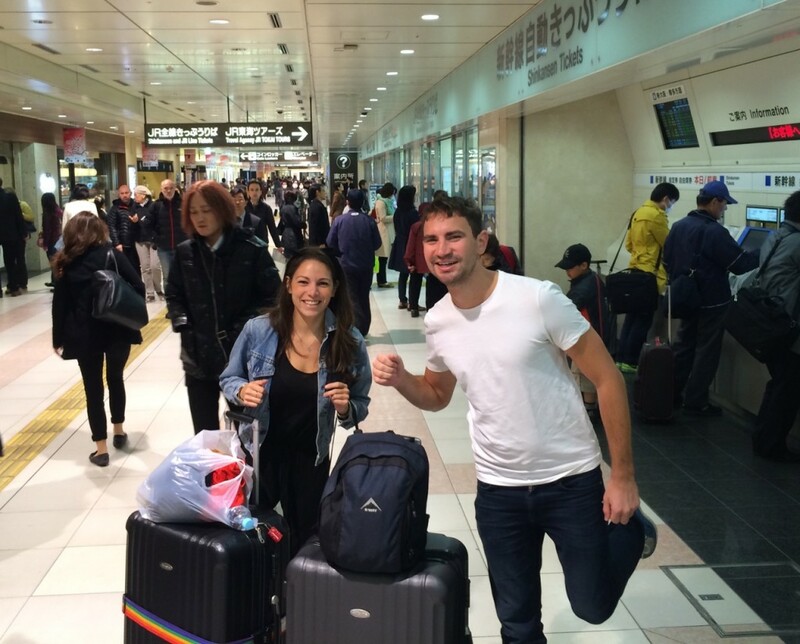 This is what we look like when we’re rushing through an awesome train station. 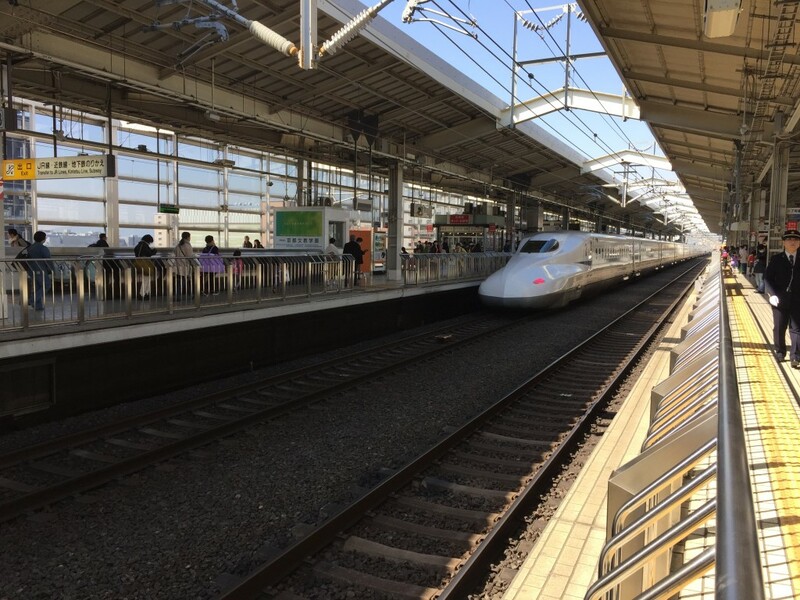 The JR bullet train kind of looks like a porpoise. We passed by Mount Fuji on the way to Hakone. Insane! Pierre Hermé French Macaroons—a gift from Laurie and Washington. SO NICE! 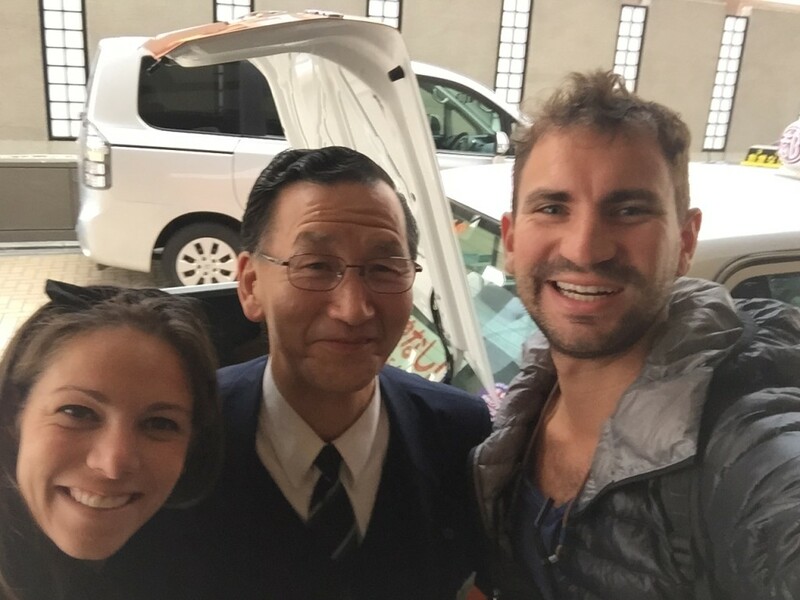 We arrived at the amazing Kyoto Station and took a taxi with the sweetest driver ever to the Kyoto Royal Hotel & Spa. The sweetest Taxi driver I’ve ever met! When we checked in I spoke with the receptionist for a good 20-minutes and planned out our transportation and itinerary for our three days in Kyoto with the help of Katie’s amazing guide. (THANKS KATIE!) Daniel tested out the toilets (and told me it was an immediate priority that I do the same) and decided that we live like peasants in America. Lobby of Kyoto Royal Hotel & Spa. 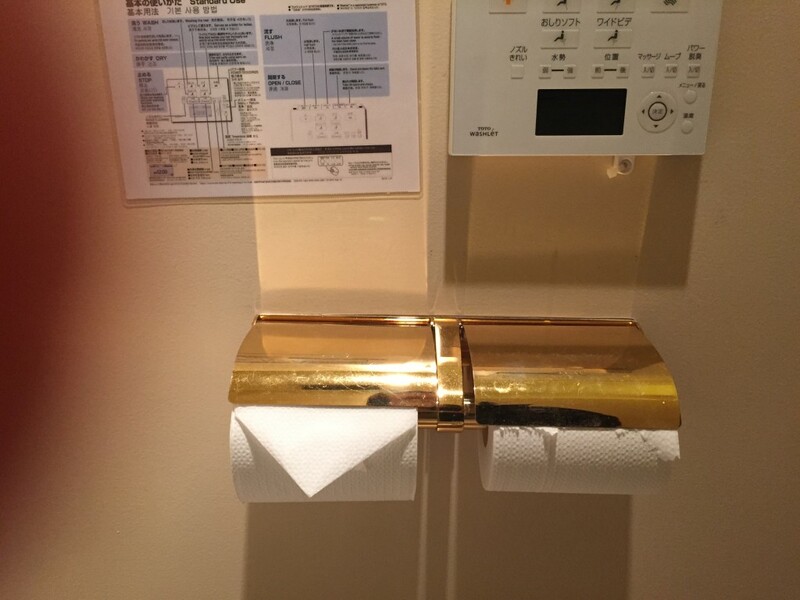 Fancy Japanese toilet usage instructions. 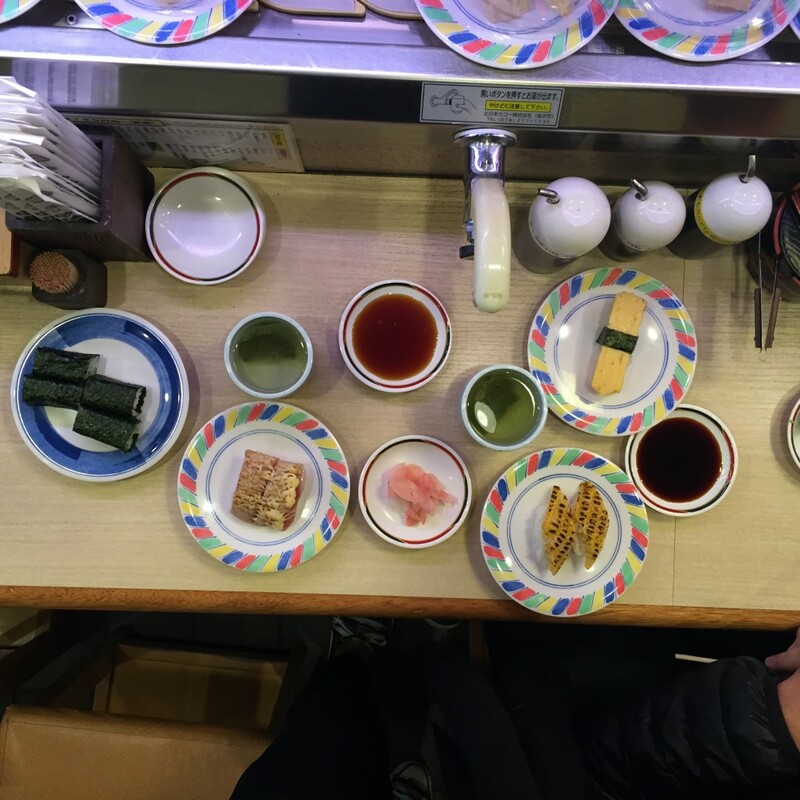 We walked across the street to Musashi Sushi, a conveyer belt style restaurant, for lunch. 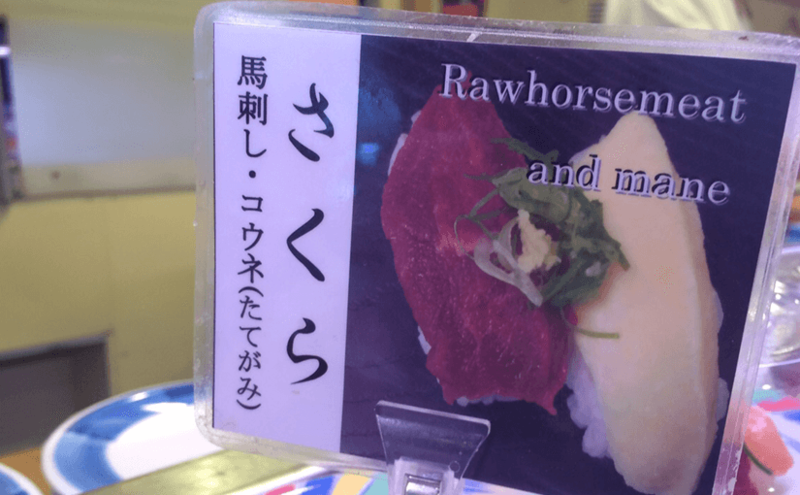 The place was delicious, but carried many things we’d never seen before like, raw horse meat, figure squid, boiled bones of fish, and black throat sea perch. We tried a “cream cheese sesame roll” that was basically a Jewish style bagel (minus the bagel). 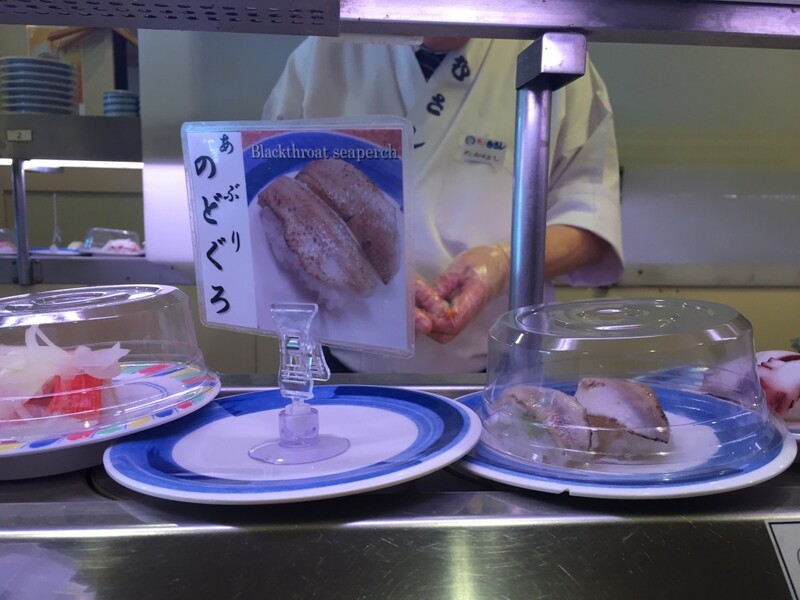 Musashi Sushi–a conveyer belt style restaurant. Daniel posing with round one of our sushi. 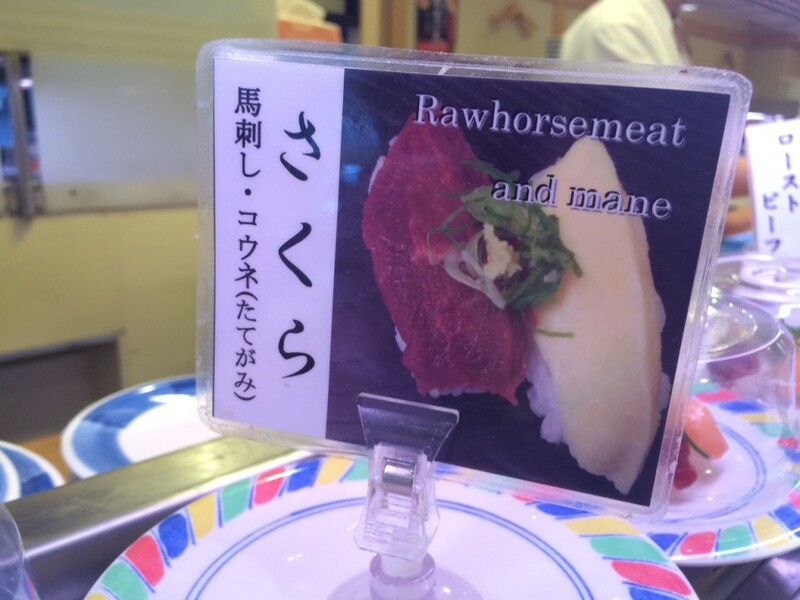 Many things we’d never seen before like, raw horse meat. Boiled bones of fish—any takers? Another thing we’d never seen before—black throat sea perch. Cream cheese sesame roll aka the Jewish style bagel roll (minus the bagel). After lunch we walked through a massive outdoor shopping mall Eirakucho and stopped for some hot milk tea, right as it started to rain. Each place we’ve been since Thailand has gotten progressively colder. We tried to buy gloves at a few stores, but since every store is preparing for spring they no longer carry winter clothes. One employee at Zara told us to try Uniqlo—when we asked her for directions she walked us out of the store and down the road until we were a few stores away (so kind and unnecessary, but we were so grateful and impressed by her kindness). Awesome and massive outdoor shopping mall in Kyoto. These three religious guys wear shoes made out of rope and follow each other in lines. 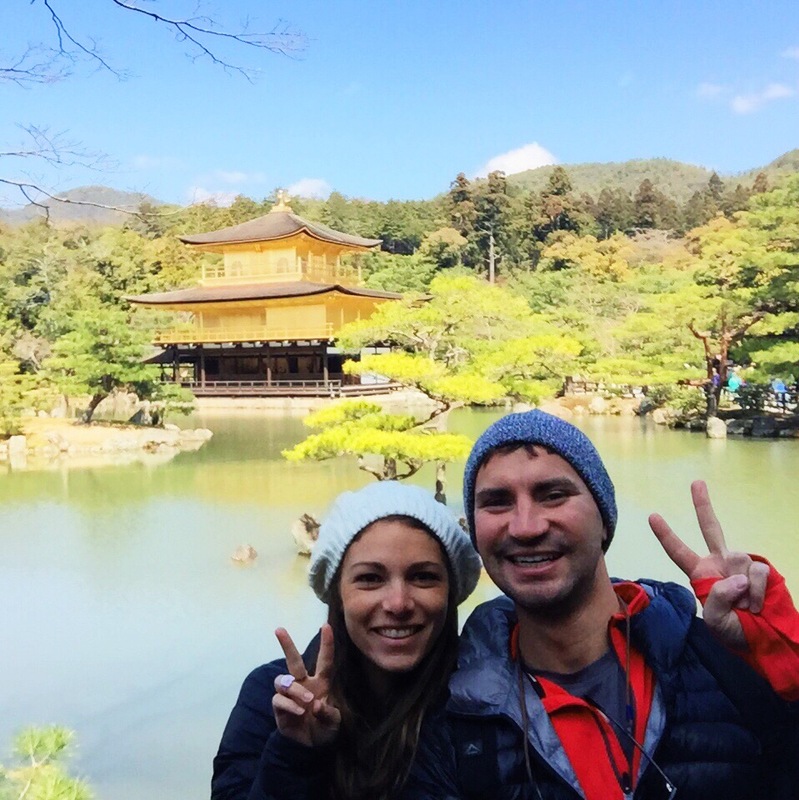 We took the subway to Kiyomizu-Gojo station and took a beautiful and very tranquil walk to Kiyomizu-dera Temple, one of the most famous landmarks in Kyoto. The walk up to the temple, called Teapot Lane, is lined with little shops selling snacks, and local handcrafted gifts and knickknacks. 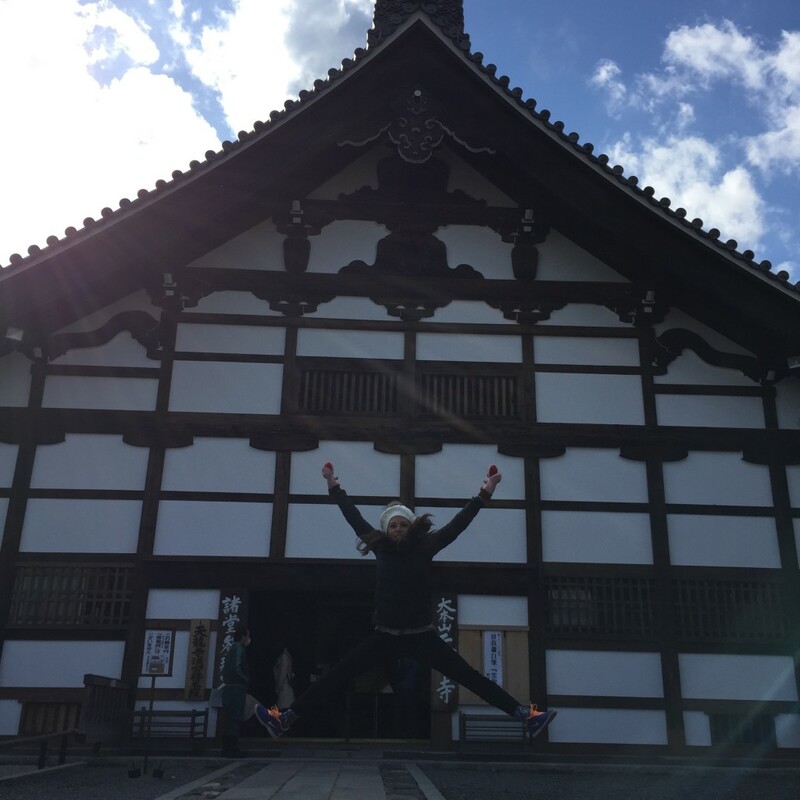 Another interesting thing to mention is that the temple was full of tourists that we have been referring to as “rent-a-geishas”—(exactly what it sounds like—tourists who rent geisha costumes and walk around the city in wooden sandals moving at a snails pace for the day). I have could never have done this for two reasons despite my love for dress up—1) There is no way I could ever feel comfortable moving so slowly 2) It was so cold outside (40 degrease Fahrenheit) there was no way I was going to suffer through the day in a silk dress and flip flips. 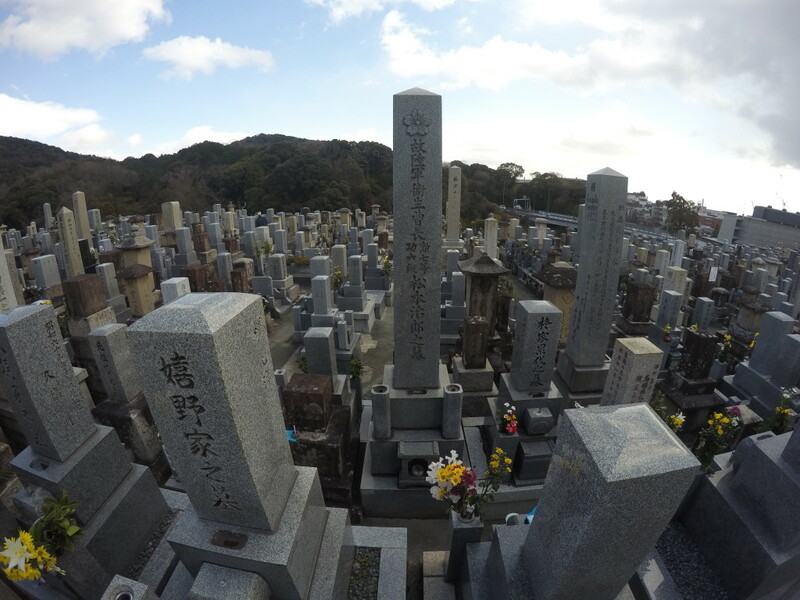 The most massive cemetery on the walk to Kiyomizu-dera Temple. 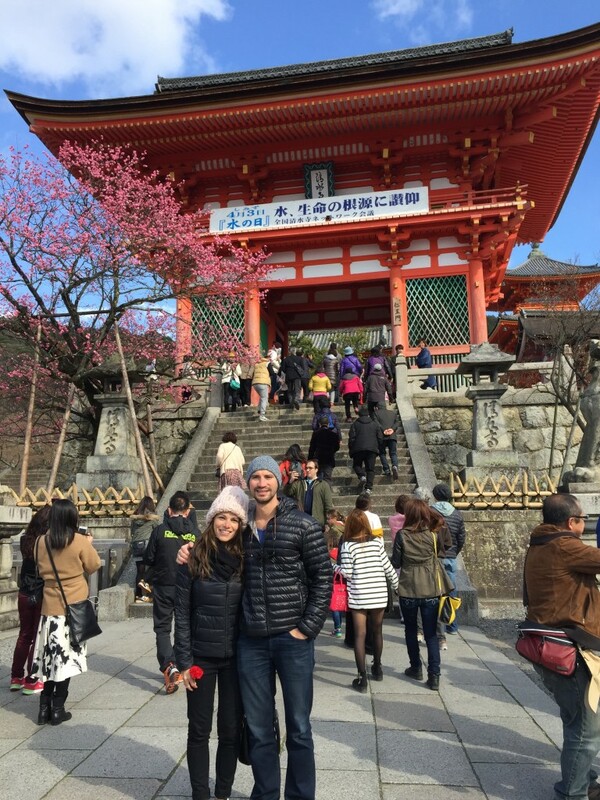 At the entrance to the walk up of Kiyomizu-dera Temple with a new Cherry Blossom tree! 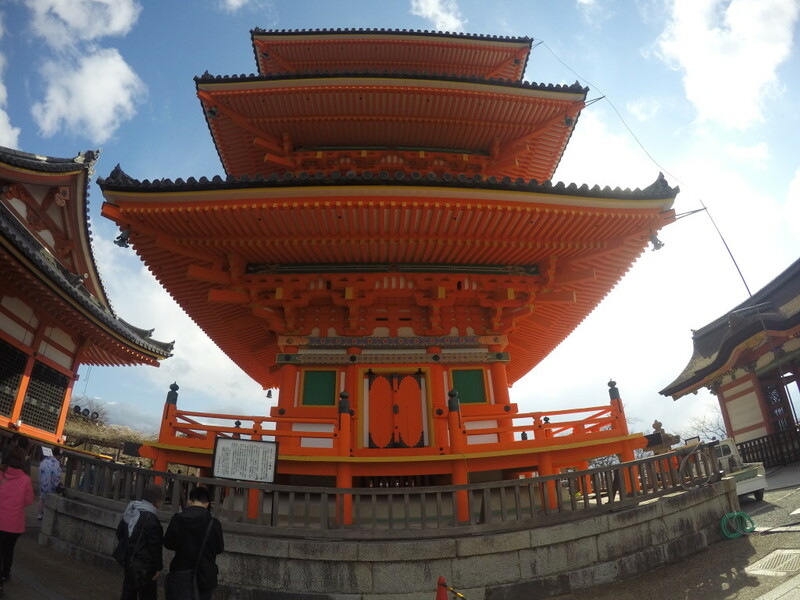 Kiyomizu-dera Temple, one of the most famous landmarks in Kyoto. Shrining it up in front of the orange towers. 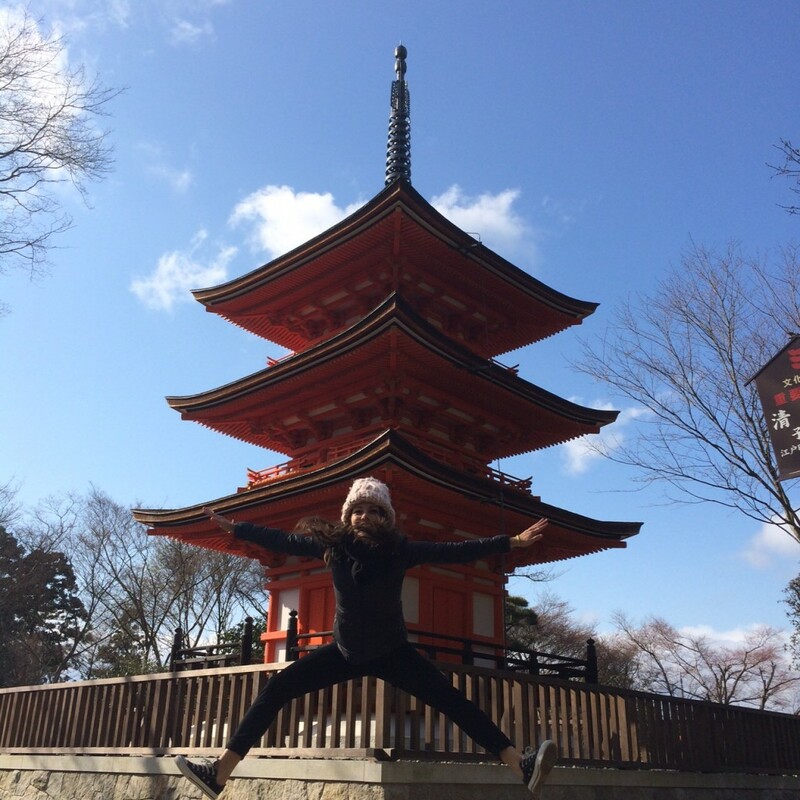 Jumping Jaxy— at Kiyomizu-dera temple in Kyoto. 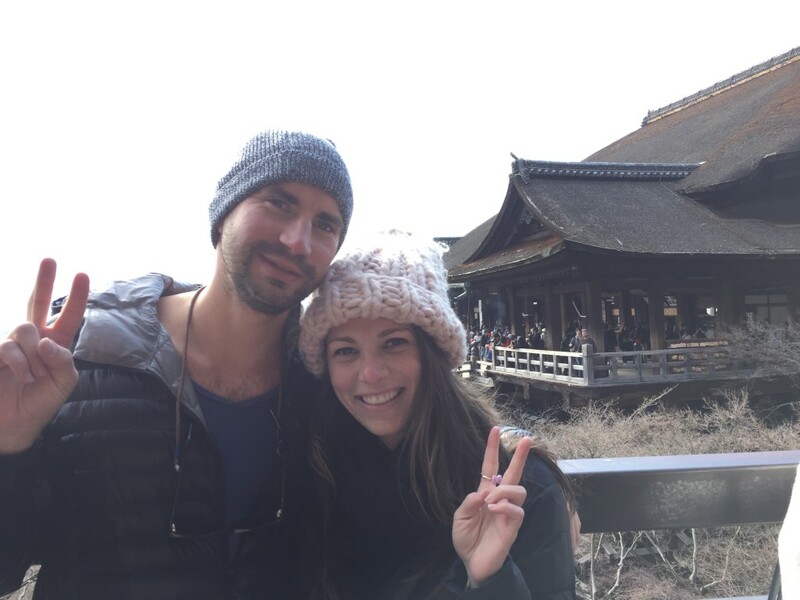 Us taking a photo on a little lookout ledge out in front of Kiyomizu-dera Temple. Buddha at the Kiyomizu-dera Temple in Kyoto. Looks so different to every other one we’ve seen. 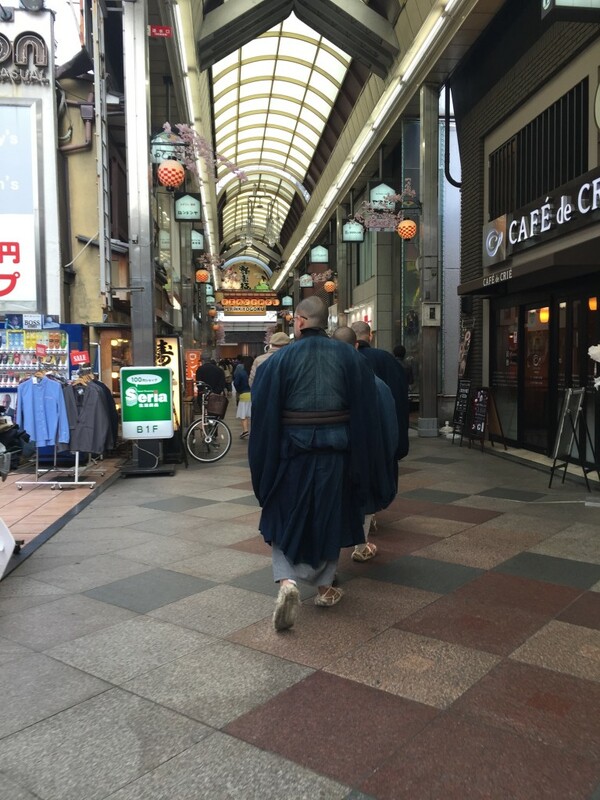 The city is full of tourists that we have been referring to as “rent-a-geishas”—(exactly what it sounds like—tourists who rent geisha costumes and walk around the city in wooden sandals moving at a snails pace for the day). 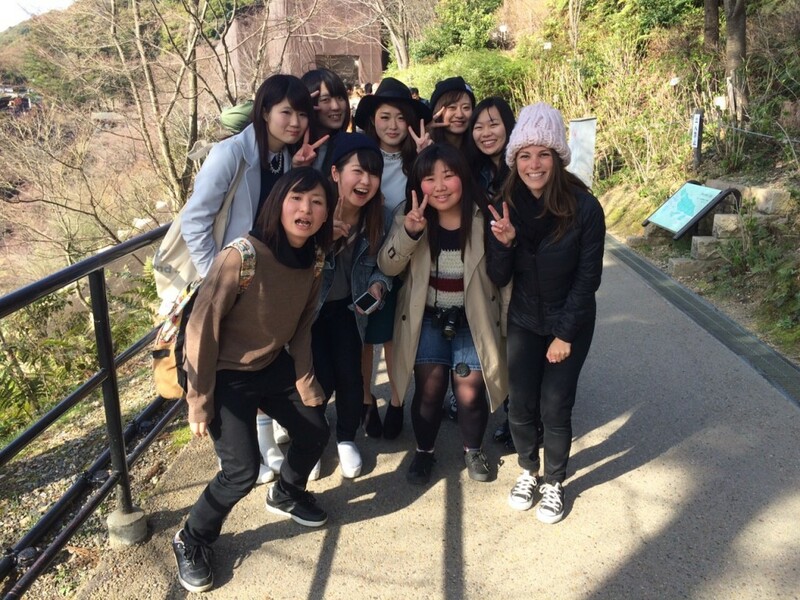 New friends at Kiyomizu-dera Temple. I think we were all equally excited about being able to be a part of a photo together. 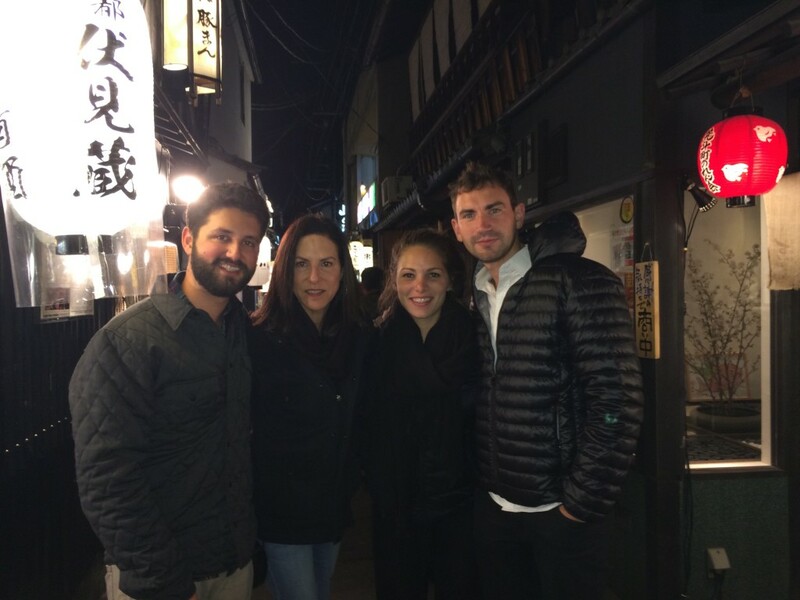 After the temple we went to explore Gion, Kyoto’s well-known entertainment and geisha district. While we saw more than our fair share of “rent-a-geishas” we didn’t see any authentic ones—to be expected as it is considered very rare to find them. 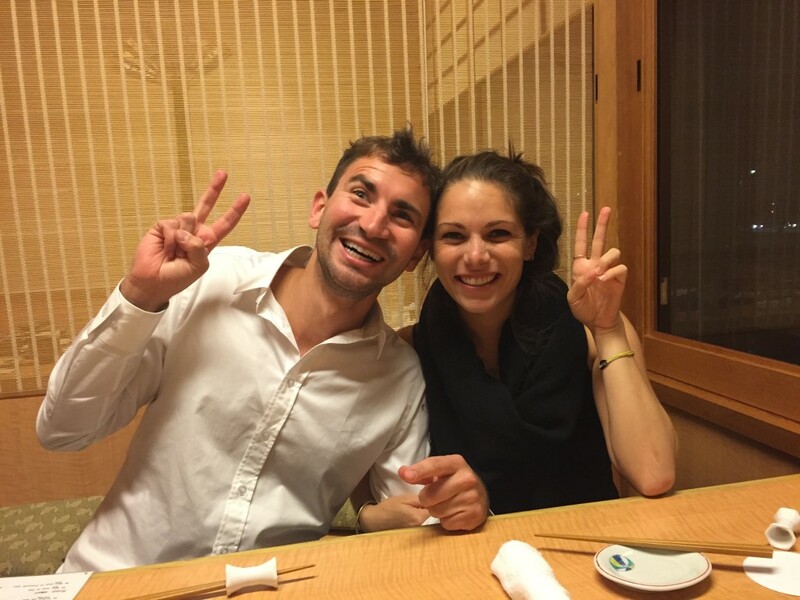 After walking the streets for a while we headed over to a green tea ceremony at a place called En. A woman in a kimono, who I’ll refer to as a tea geisha (because I’m not sure what else to call her) explained traditional Japanese manners to us and then told us that a tea ceremony is about four things—1) Peace and Harmony 2) Respect 3) Purity 4) Tranquility. 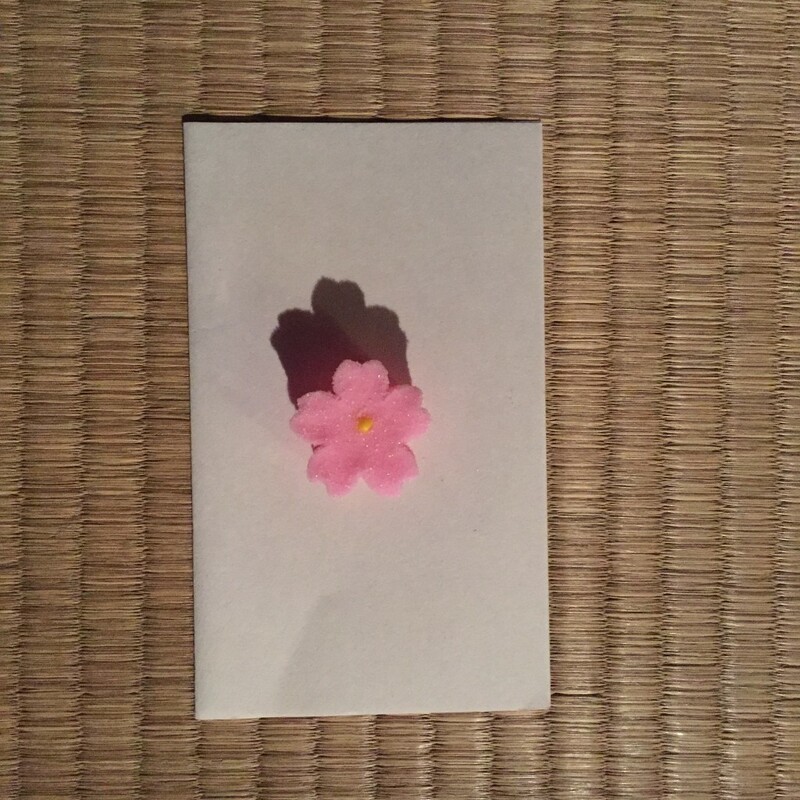 After a lengthy explanation of these things, a younger tea geisha walked into the room and performed the tea ceremony in dead silence (all you could hear was the sound of water boiling in the kettle and being poured). Every movement is so precise and thought out; every action has meaning. 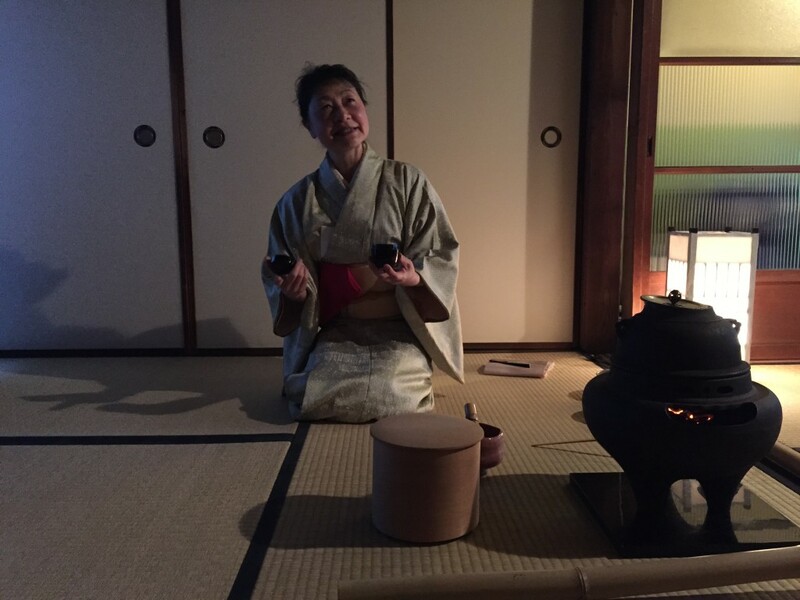 Once the tea-geisha was finished with her presentation, we were given a Japanese sweet and the necessary tools to make our own green tea from Matcha powder—this was great! After the ceremony Daniel asked the tea-geisha “Do people actually speak to each other at Japanese tea parties?” and her answer was “Only a little bit—the main guest asks the host about the history of the tea utensils, but that’s all the conversation made”—for the record this is definitely not my kind of tea party. 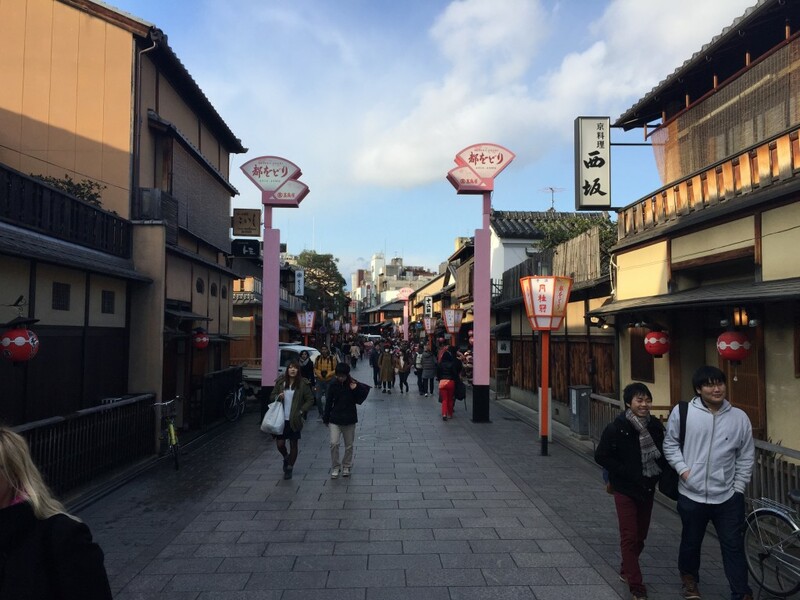 Gion District—home of the geisha. A woman in a kimono, who I’ll refer to as a tea geisha (because I’m not sure what else to call her) explained traditional Japanese manners to us and then told us that a tea ceremony is about four things—1) Peace and Harmony 2) Respect 3) Purity 4) Tranquility. 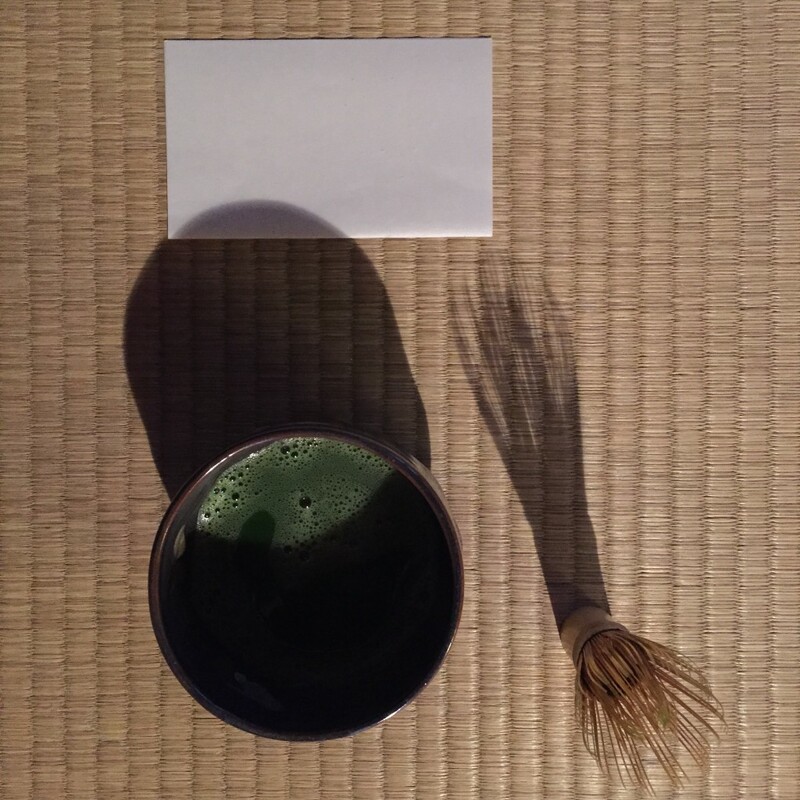 Cup of self-made matcha green tea, with a bamboo whisk. Japanese sweet to enjoy with your cup of tea. 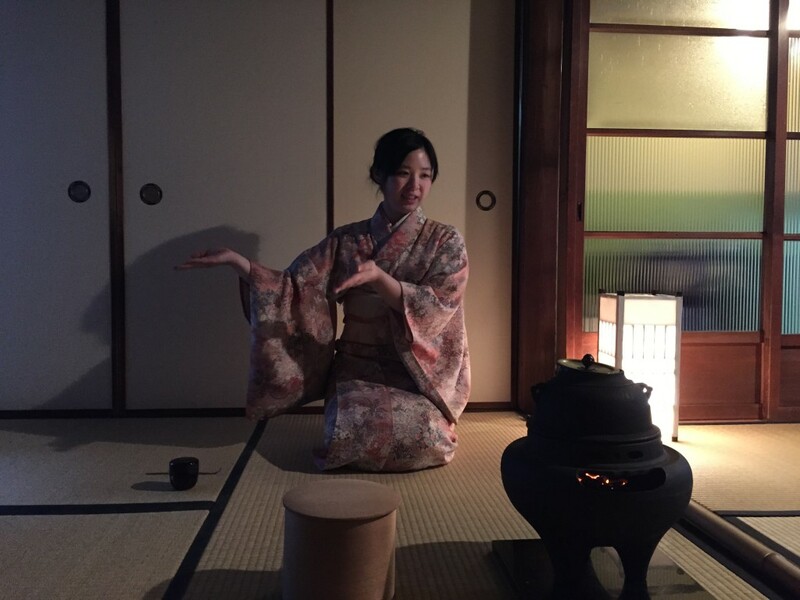 This younger tea geisha performed the tea ceremony in dead silence (all you could hear was the sound of water boiling in the kettle and being poured). Every movement is so precise and thought out; every action has meaning. 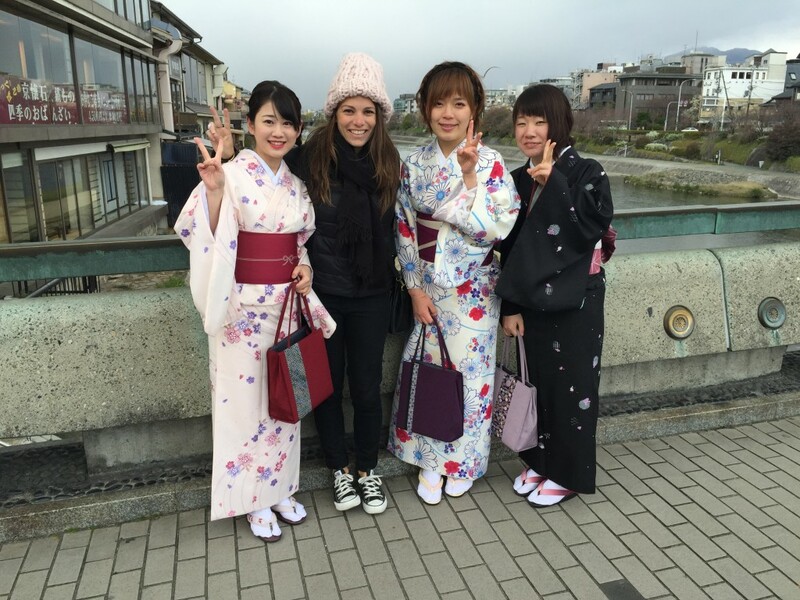 When we got out of the tea ceremony, the weather had dropped into the high thirties. We made friends with a fabulous woman named Deisha from Portland, but then split up because we were turning blue. 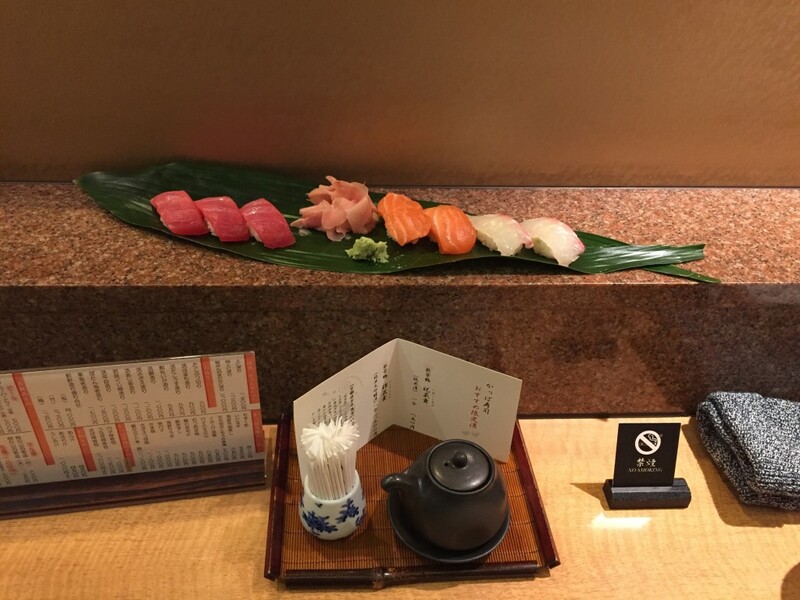 We returned to our hotel, put on more clothes, and went to a very cool Japanese restaurant called Kappa Sushi. 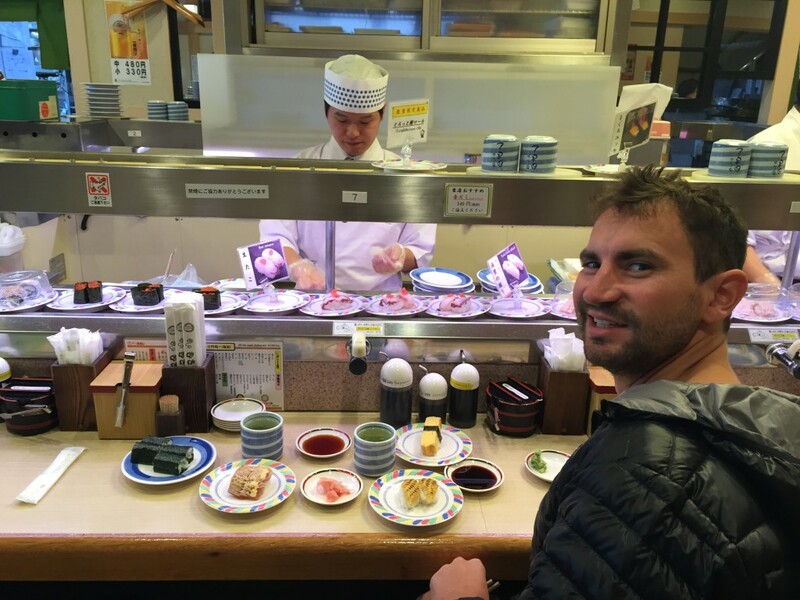 The sushi was insane—best salmon nigiri we’ve ever tried. Towards the end of our meal a good-looking older Japanese woman carrying a white pony fur purse with a taxidermy frog (serious jewels inset for eyes) and wearing a dental hygienist mask sat down next to us—she reminded me of the sassy socialite woman from the movie Harriet the Spy. 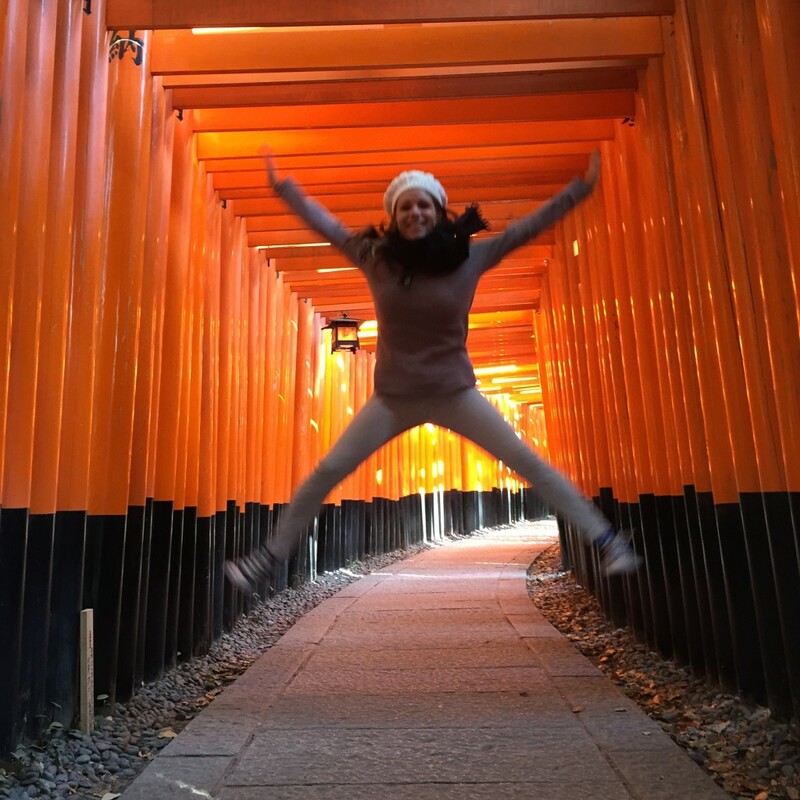 Anyway, we started talking to her (her name is Sudako) and learned that she lived in the Oakland Hills for twenty years but now lives in Osaka—small world. We asked her why people wear the hygienist mask and she explained that she wears it for allergies because it’s spring time (even though it feels like the dead of winter), but some women think it’s very fashionable to just show their eyes—so they pinch the top of the mask and make it look higher up on their nose to appear more western—so strange. Before we left, she gave us some sage life advice aka she told us about the importance of buying quality products—“I bought a $700 lice-cooker and it’s never failed me”. Fun fact: just like Daniel’s niece, Sudako’s granddaughter is also named “Orivia.” I’m so thankful we had the opportunity to meet her. She was a real gem (just like the eyes on the frog on her purse). Awesome Japanese restaurant called Kappa Sushi. 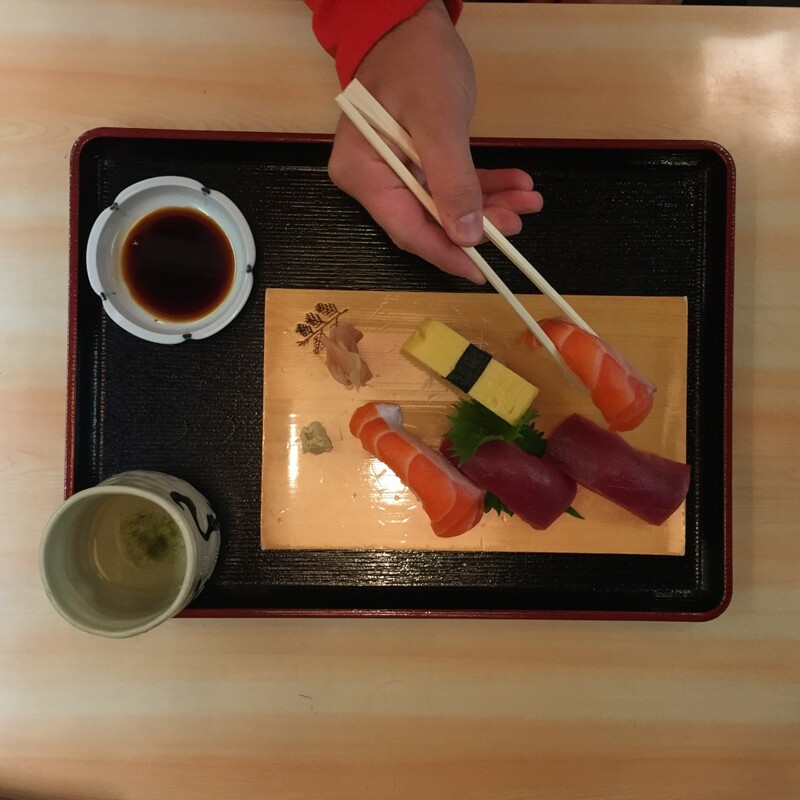 The sushi was insane—best salmon nigiri we’ve ever tried. We asked Sudako why people wear the hygienist mask and she explained that she wears it for allergies because it’s spring time (even though it feels like the dead of winter), but some women think it’s very fashionable to just show their eyes—so they pinch the top of the mask and make it look higher up on their nose to appear more western—so strange. Shivering cold, we walked down the narrow streets in search of a drink (it was now 35 degrease out). A man approached us and asked what we were looking for, we told him a good bar and he pointed us down the narrowest passage of micro restaurants and bars to a place called Concrete Bar. Confused as to exactly where he was pointing, he then walked us towards a brown door (shorter than I am) covered in stickers and slid it open to reveal a two-story closet sized bar—so cool! 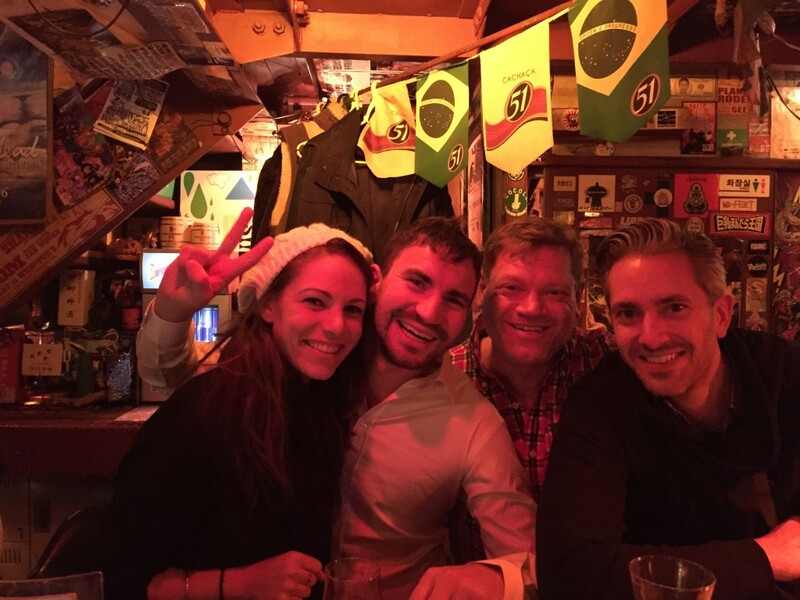 We sat down and ordered whiskies and were soon joined by two men from Sweden named Mats and Robert. We spent the rest of the night drinking and chatting about all the fun things in life (e.g. travel, great food and drinks, Netflix and HBO television shows). 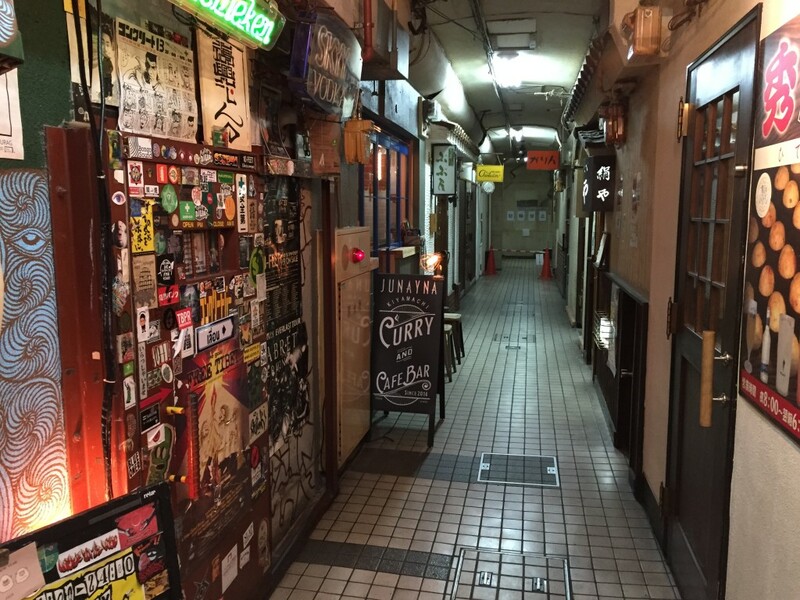 A man approached us and asked what we were looking for, we told him a good bar and he pointed us down the narrowest passage of micro restaurants and bars to a place called Concrete Bar. 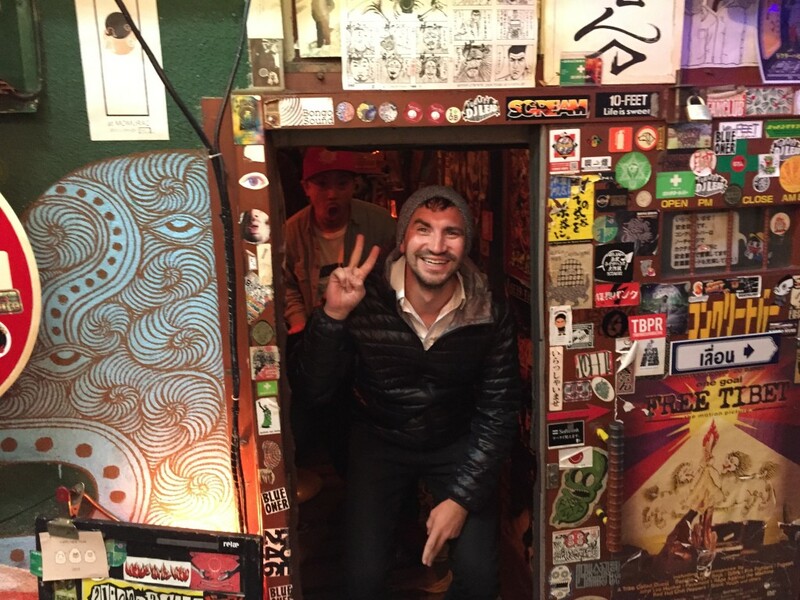 A tiny brown door (shorter than I am) covered in stickers reveals a two-story closet sized bar—so cool! HI Daniel! Group shot inside of Concrete Bar—me, Daniel, Mats, and Robert. Kyoto coming in for the win!